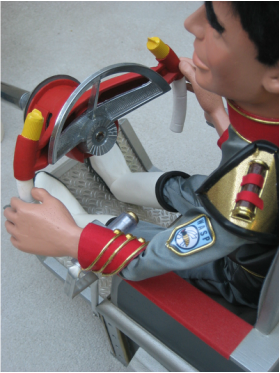 Puppet-scale control wheel from Stingray's interior. 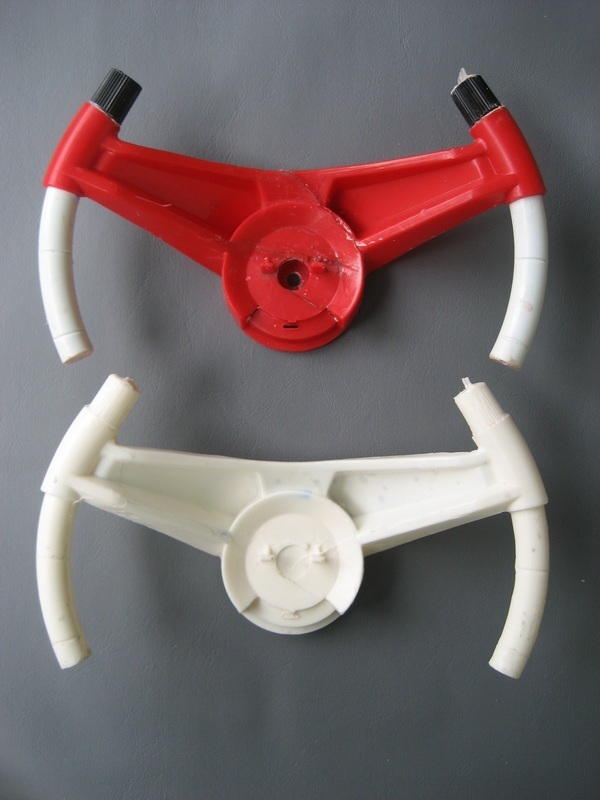 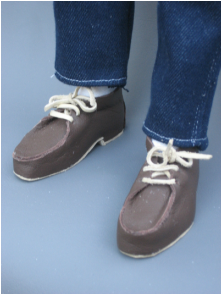 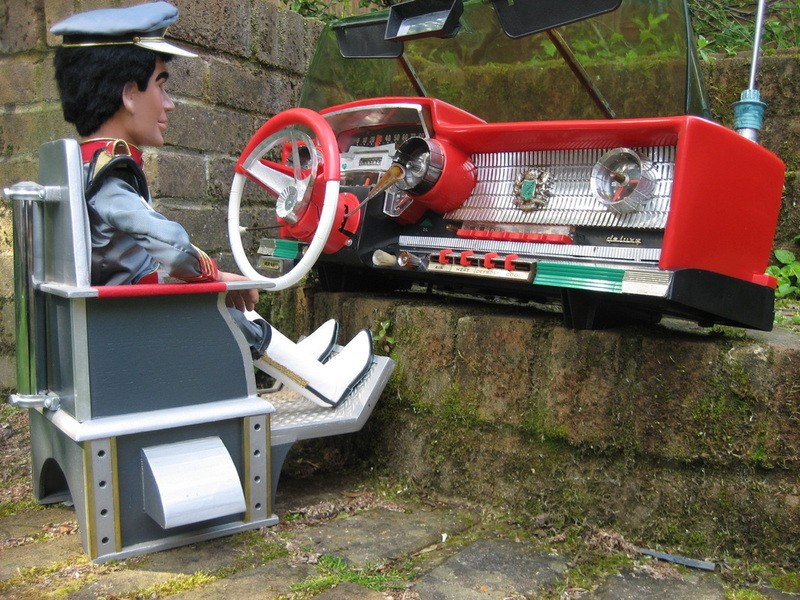 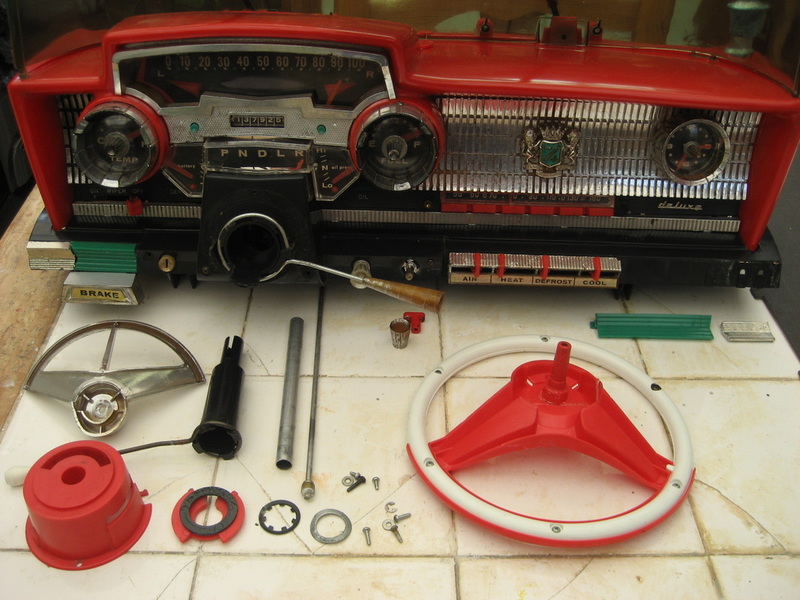 The originals were made using a child's toy car dashboard. 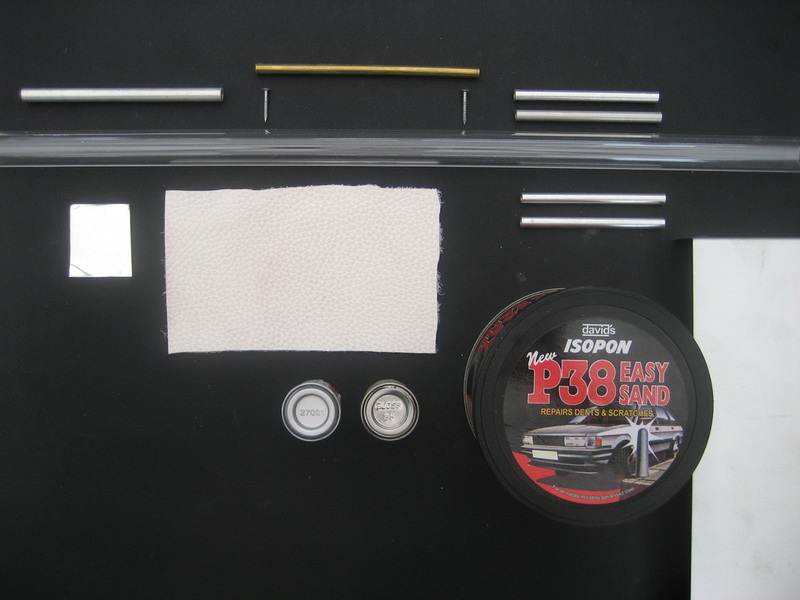 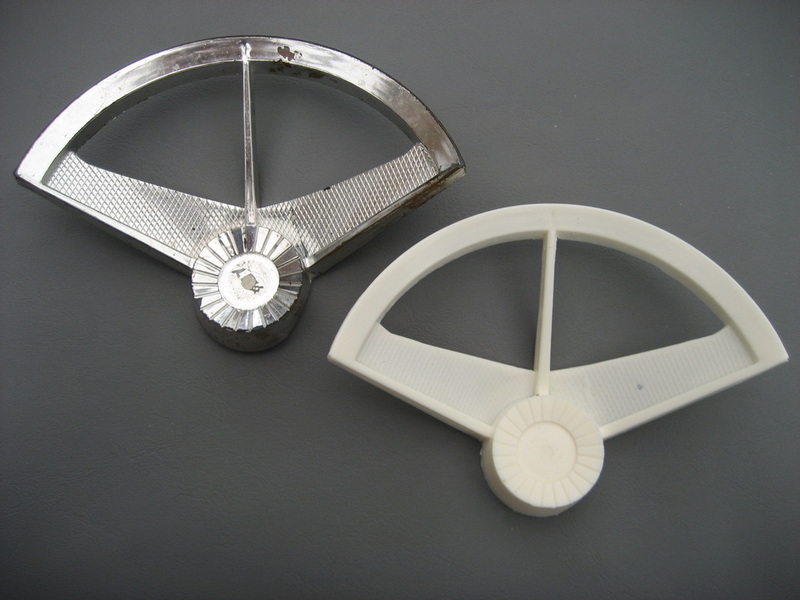 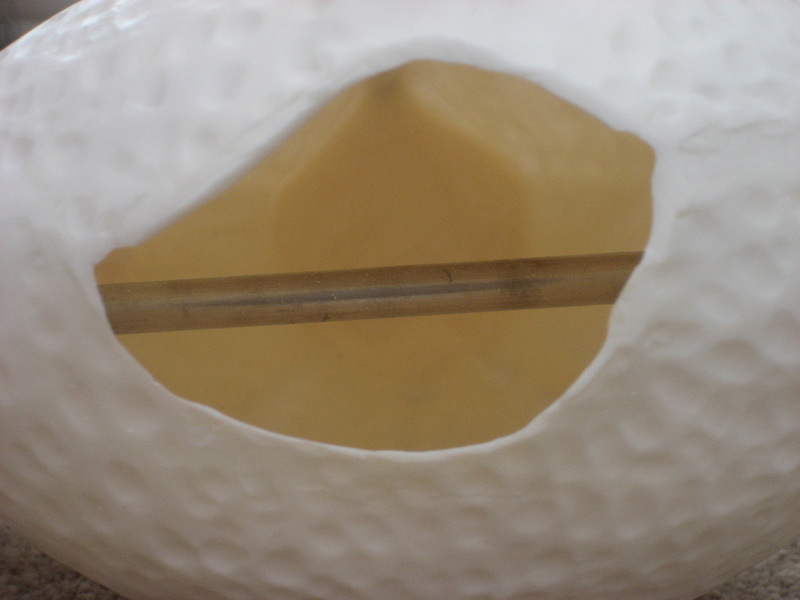 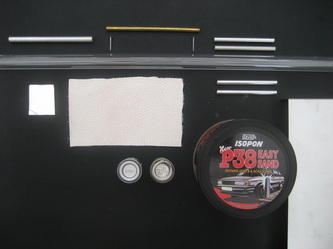 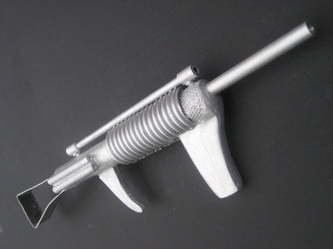 I was lucky enough to obtain one of the toys; I cut the wheel down, adapting it to match the prop, and then took moulds so that I can replicate it. 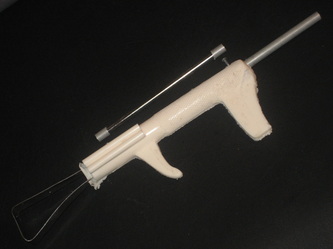 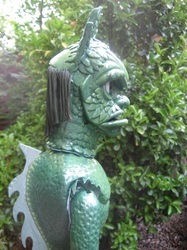 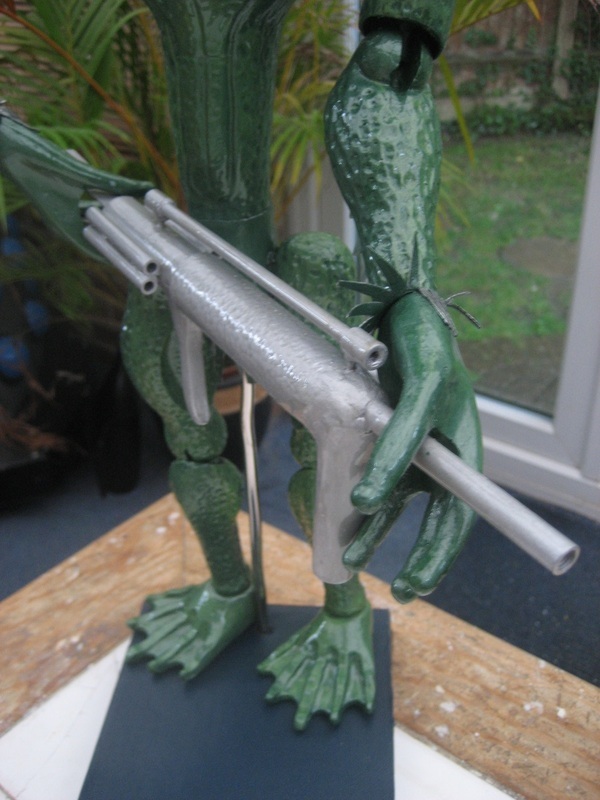 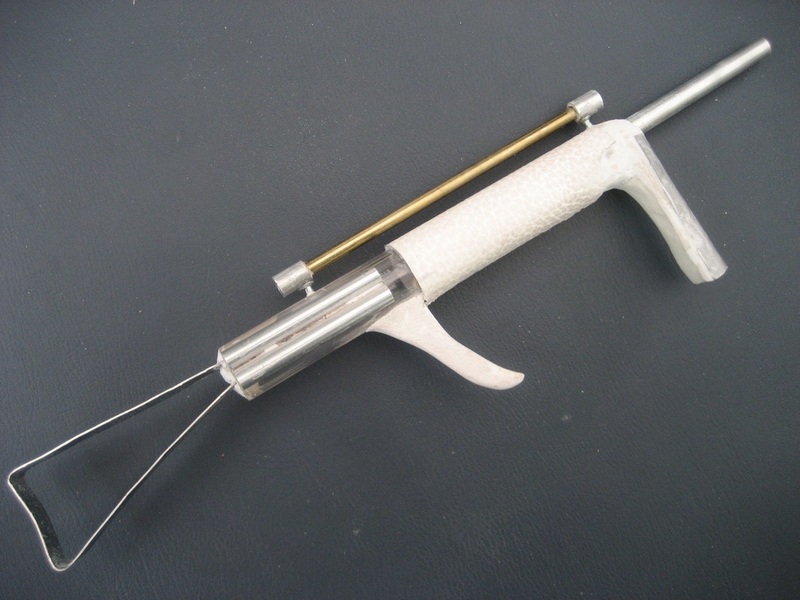 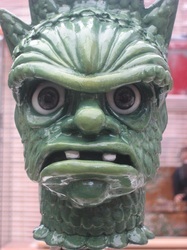 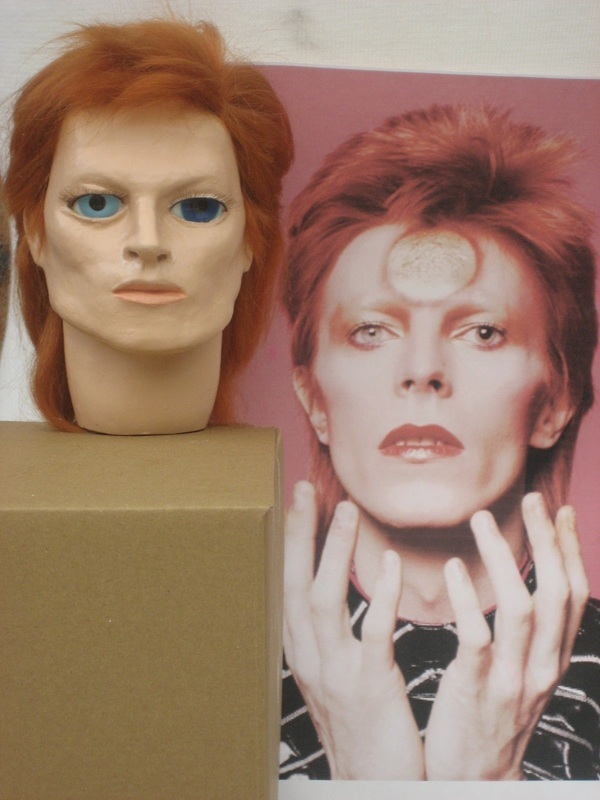 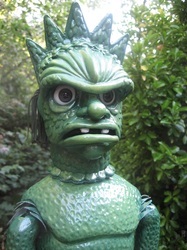 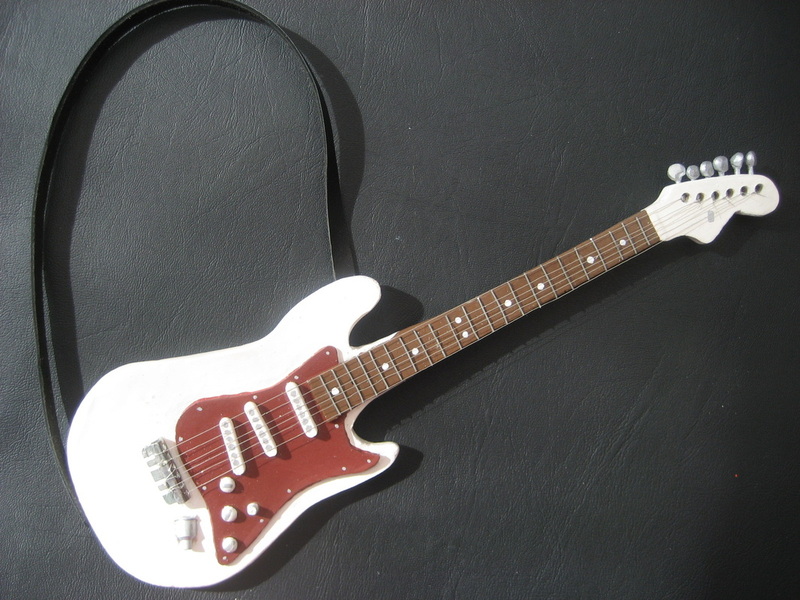 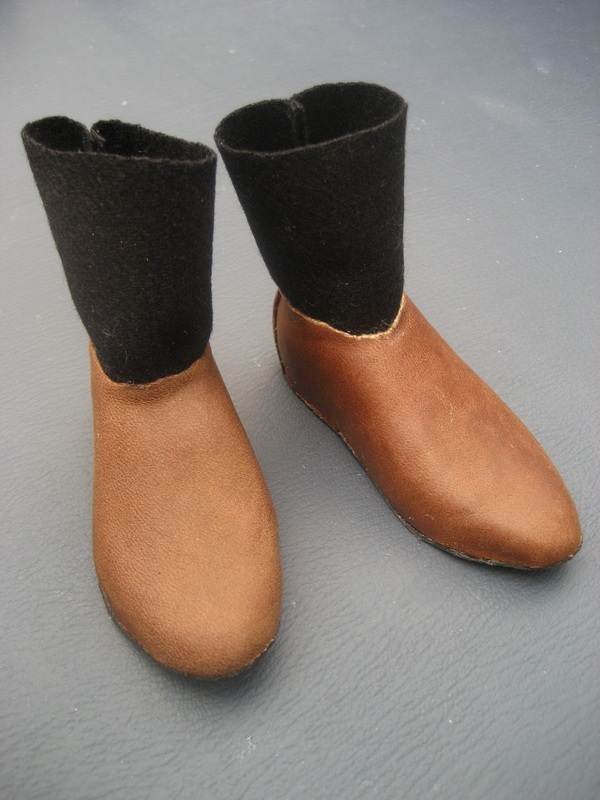 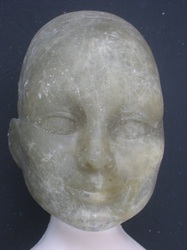 My completed replica - made in resin and painted using Humbrol Enamels. 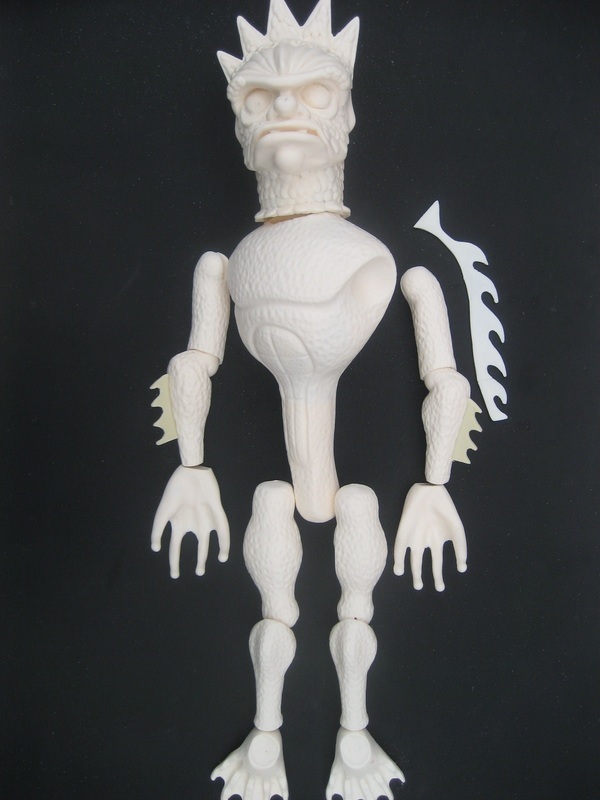 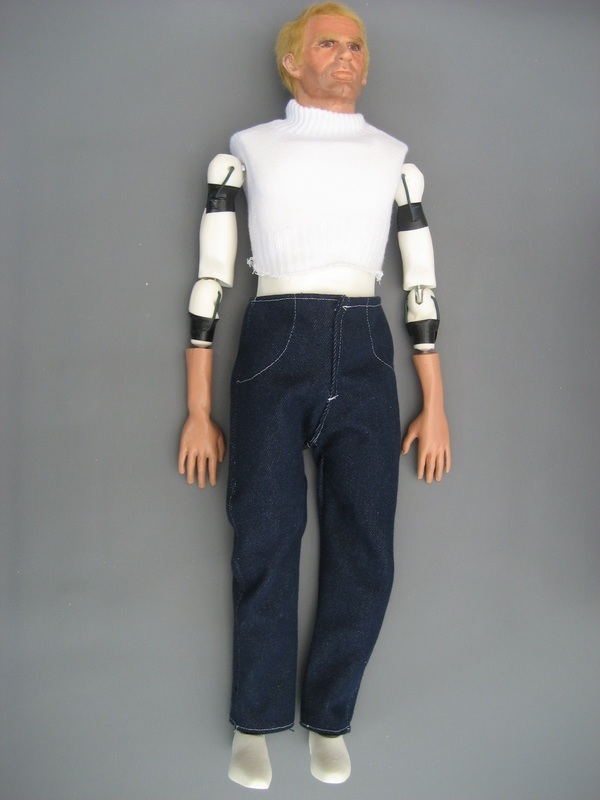 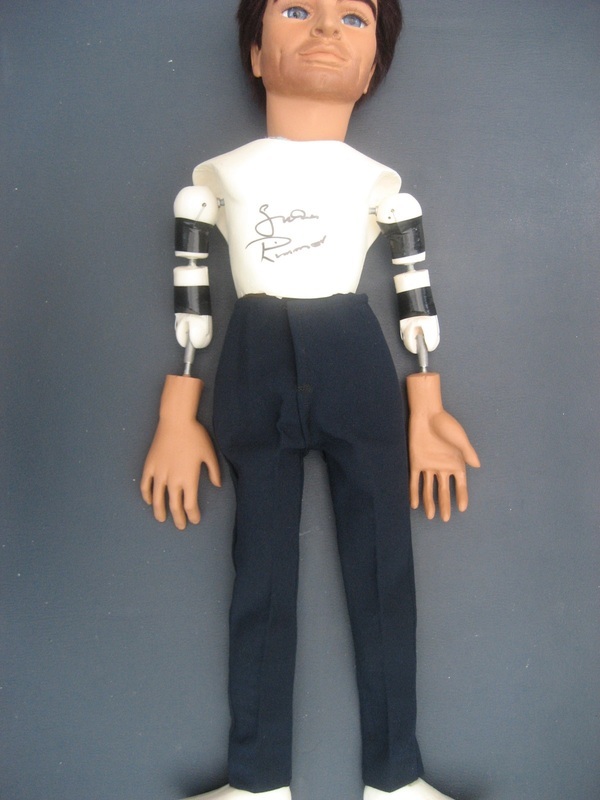 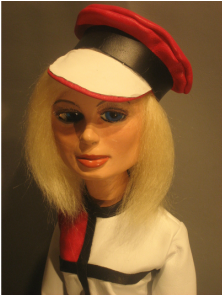 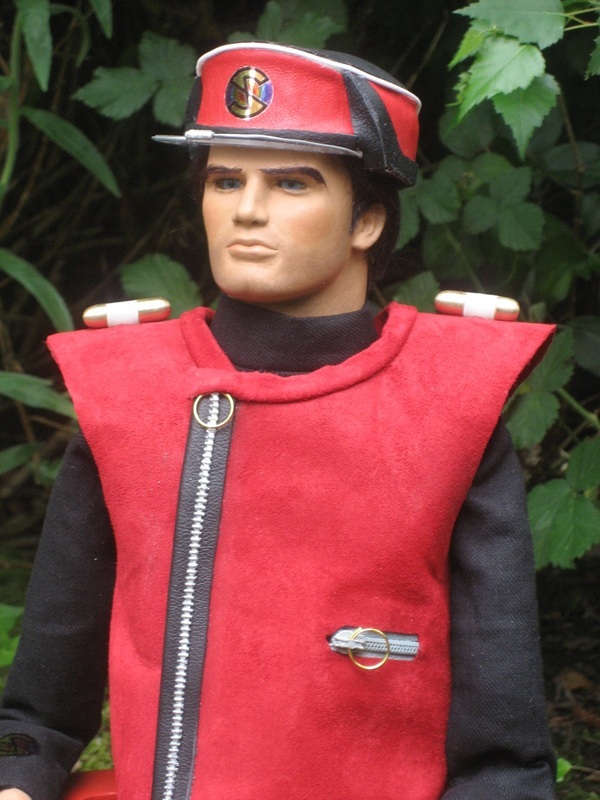 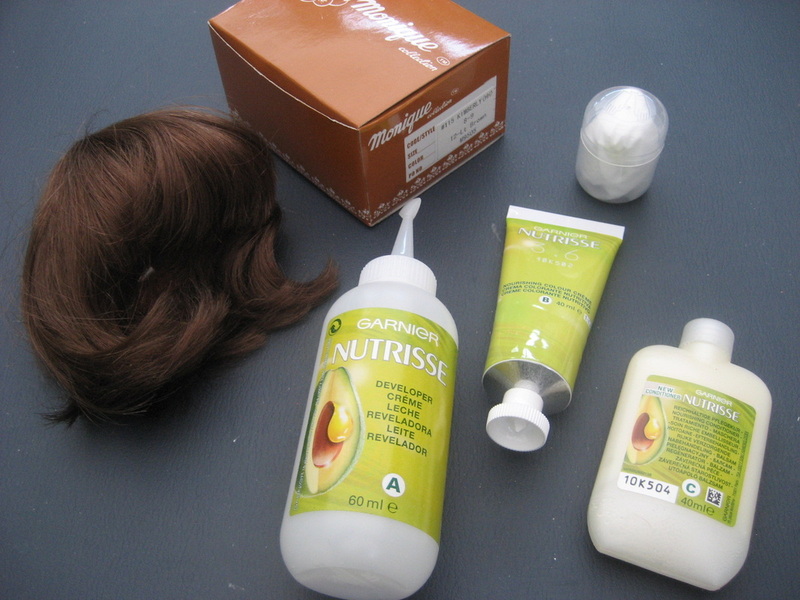 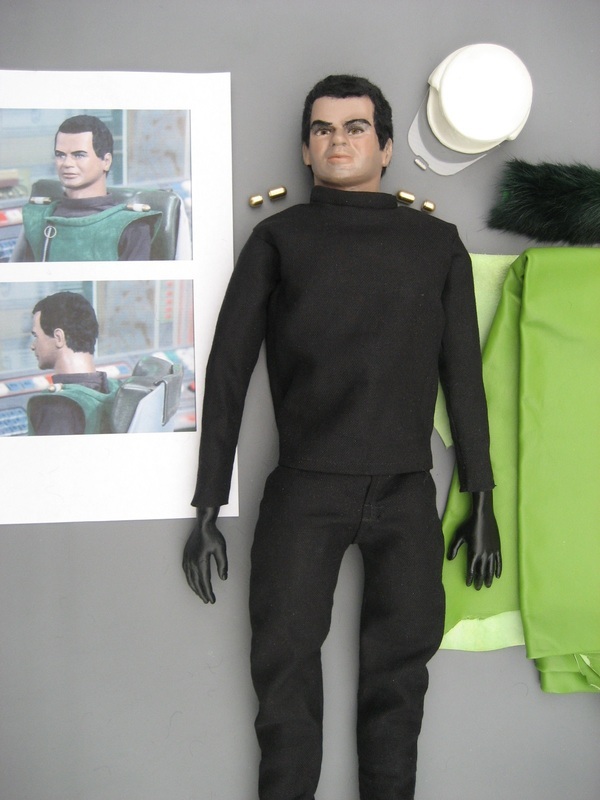 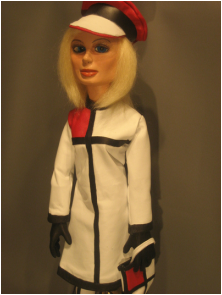 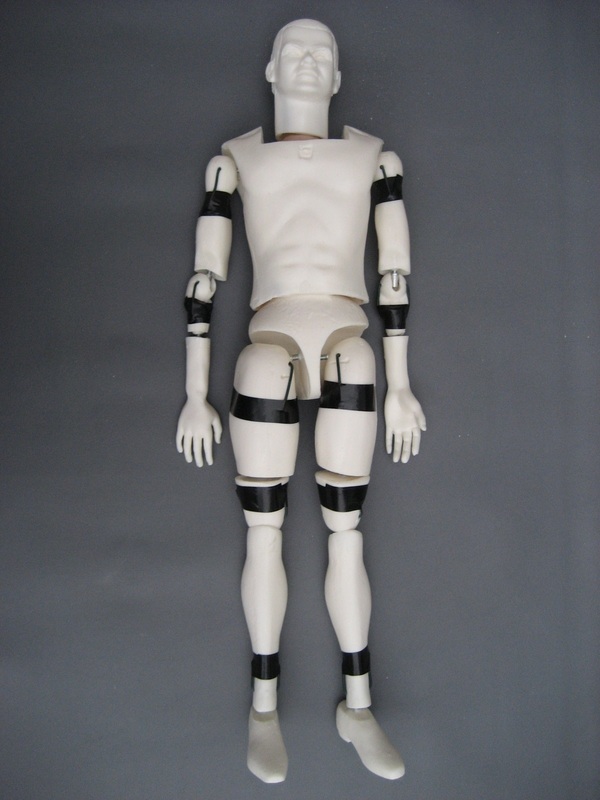 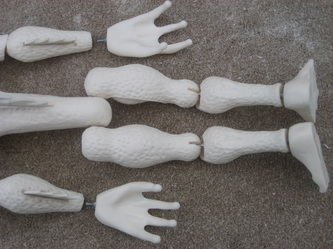 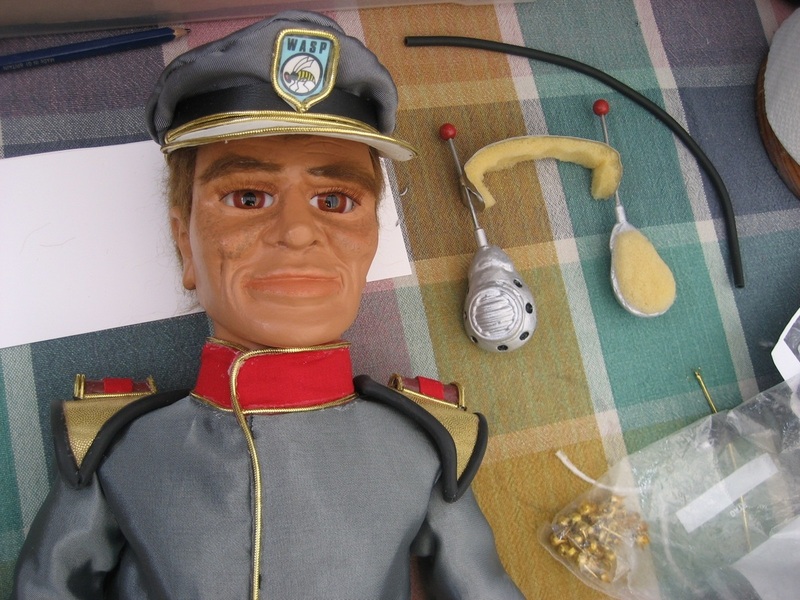 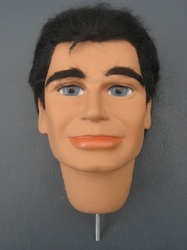 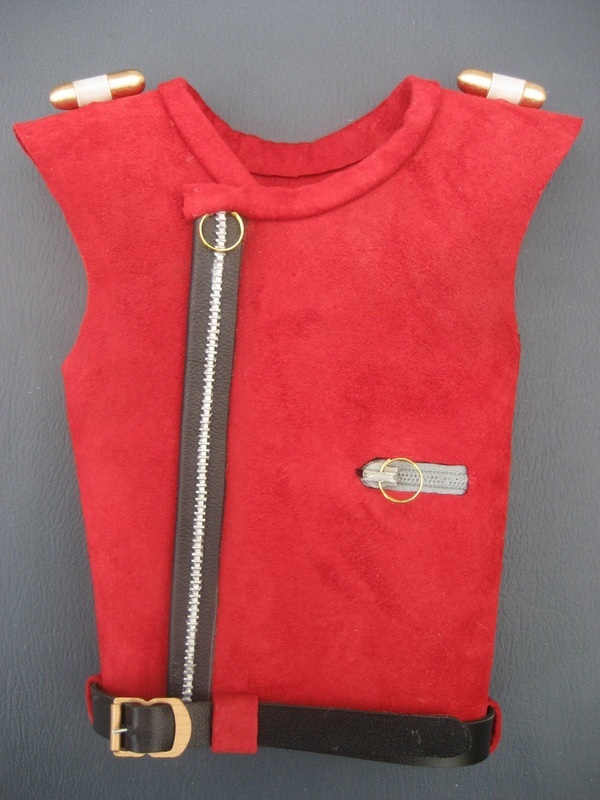 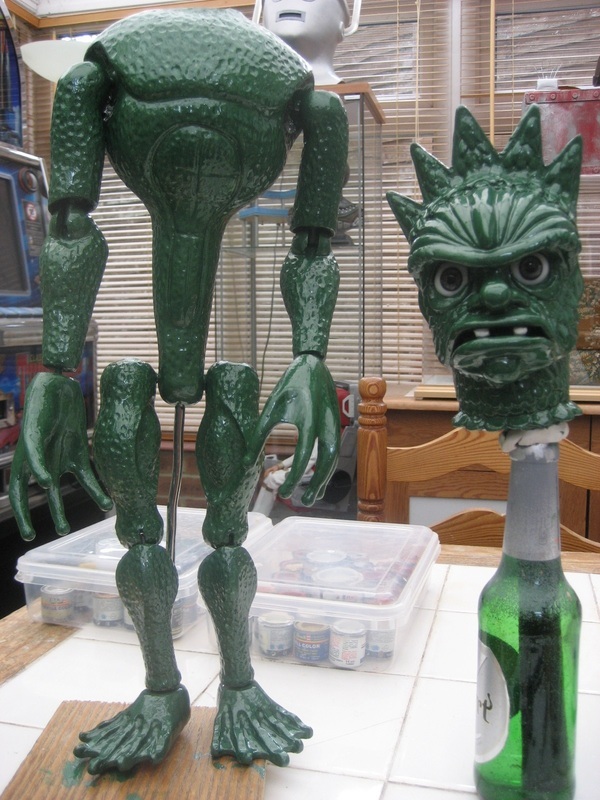 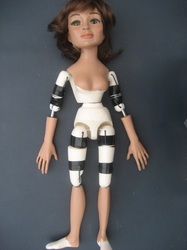 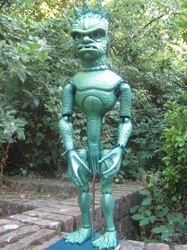 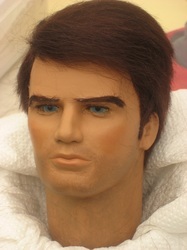 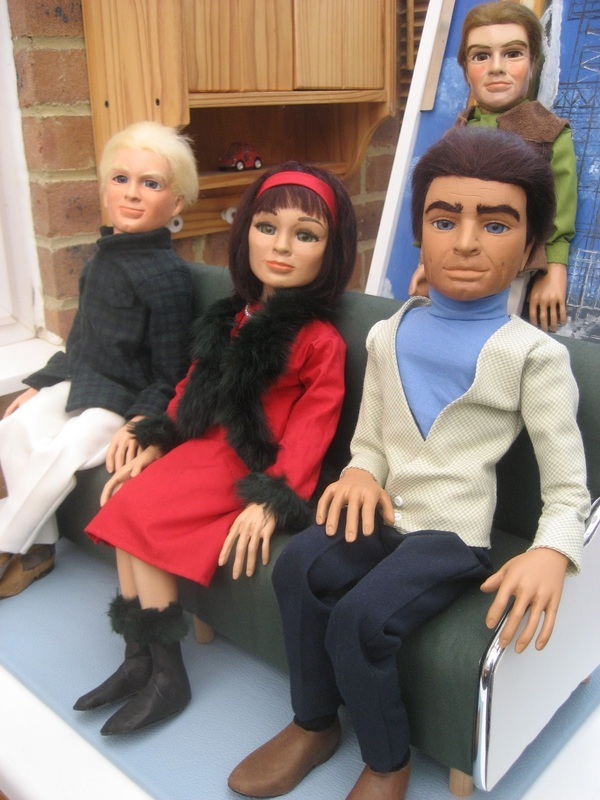 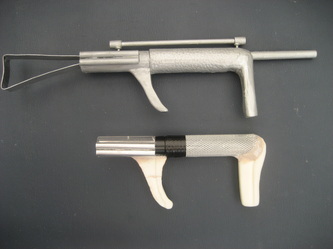 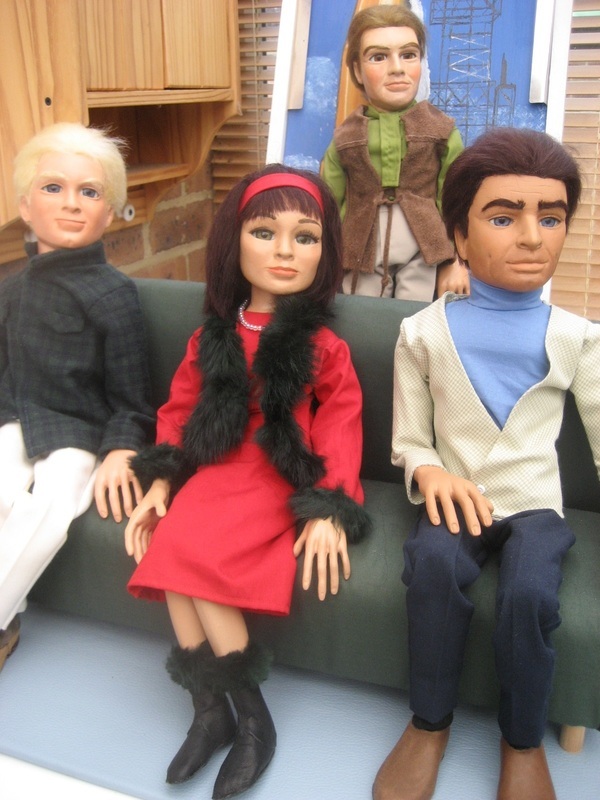 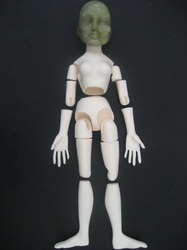 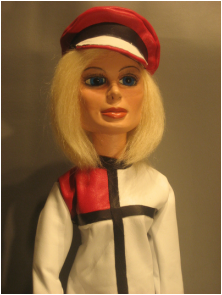 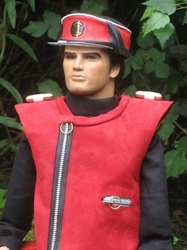 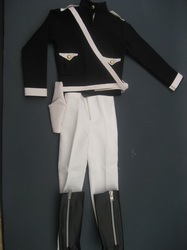 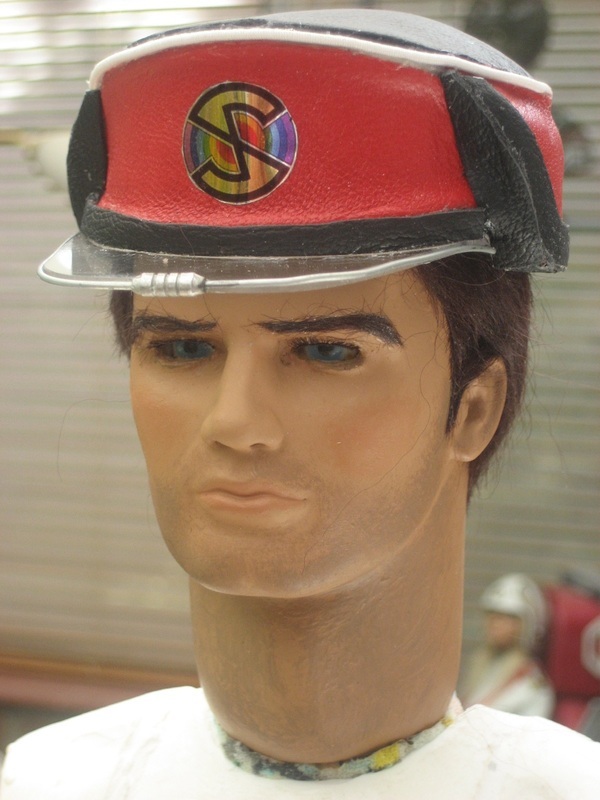 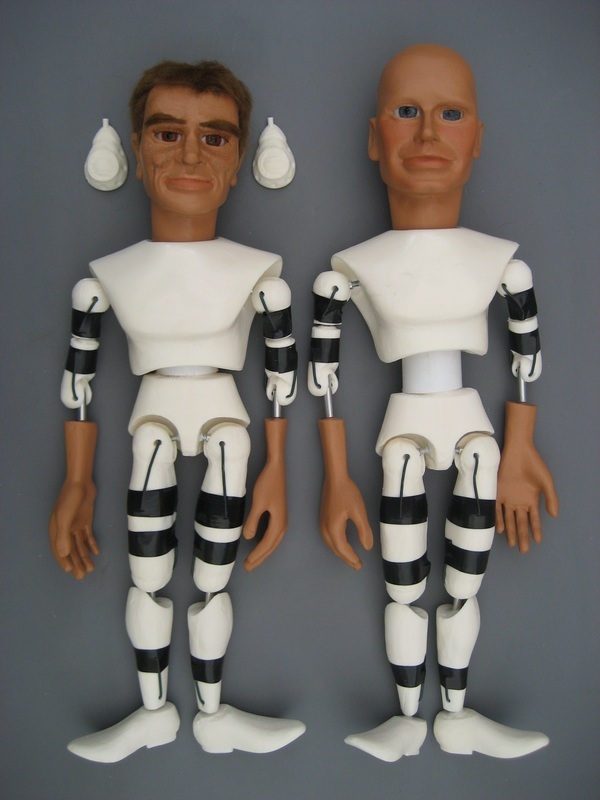 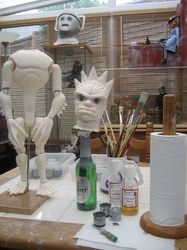 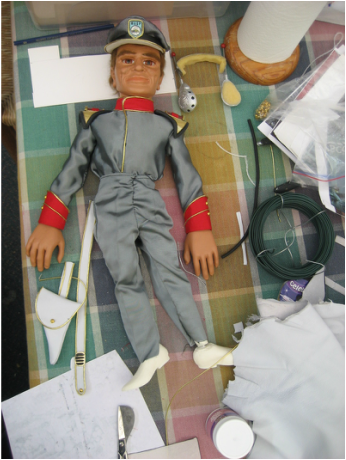 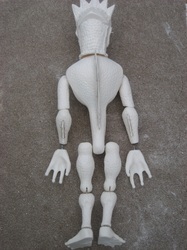 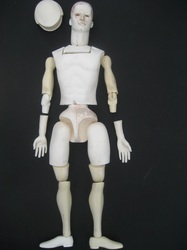 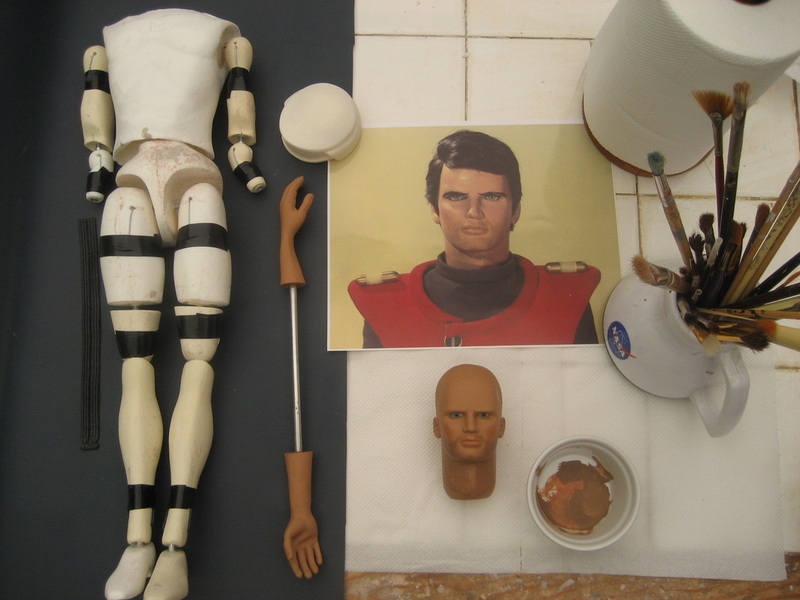 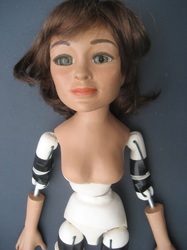 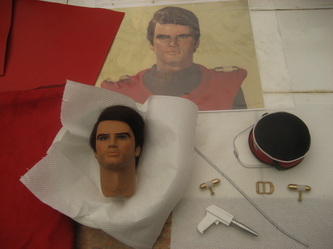 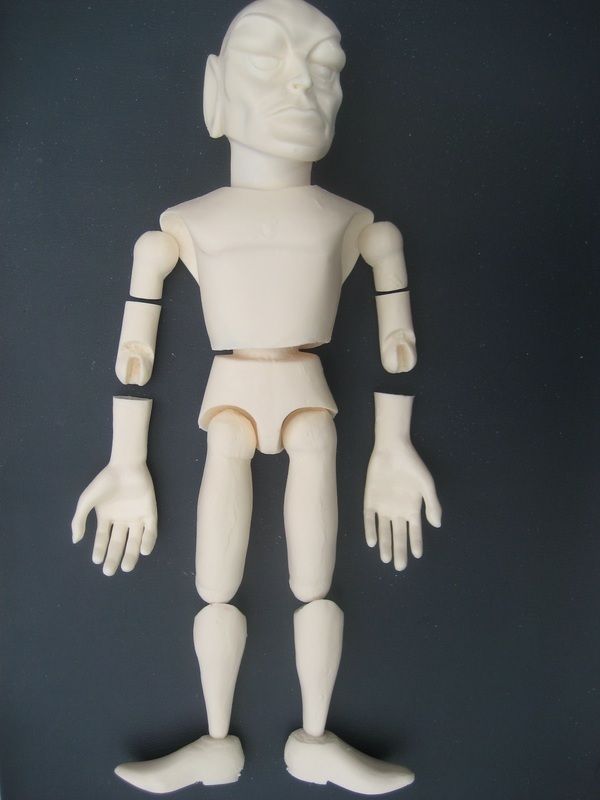 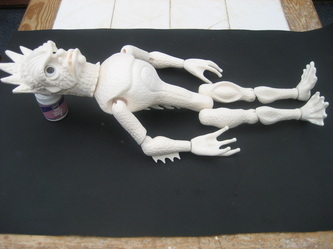 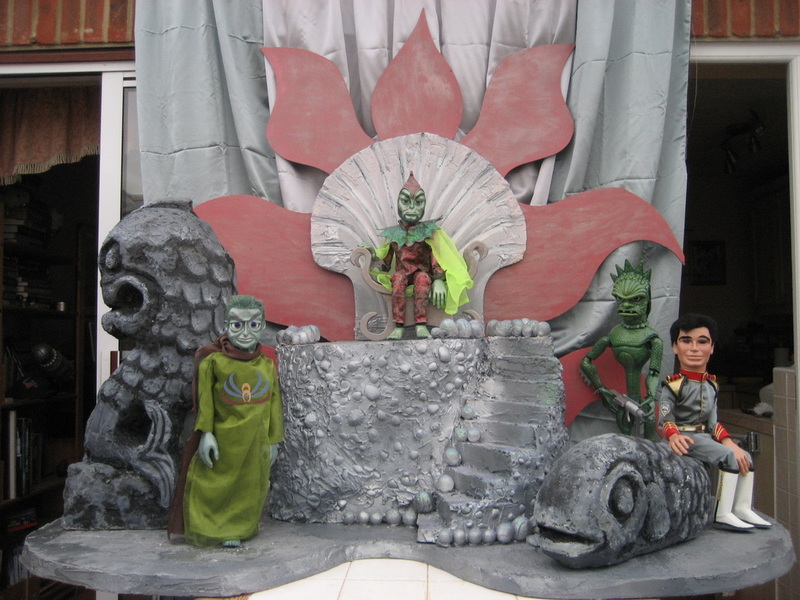 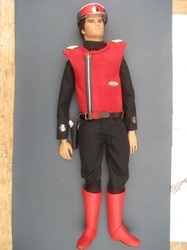 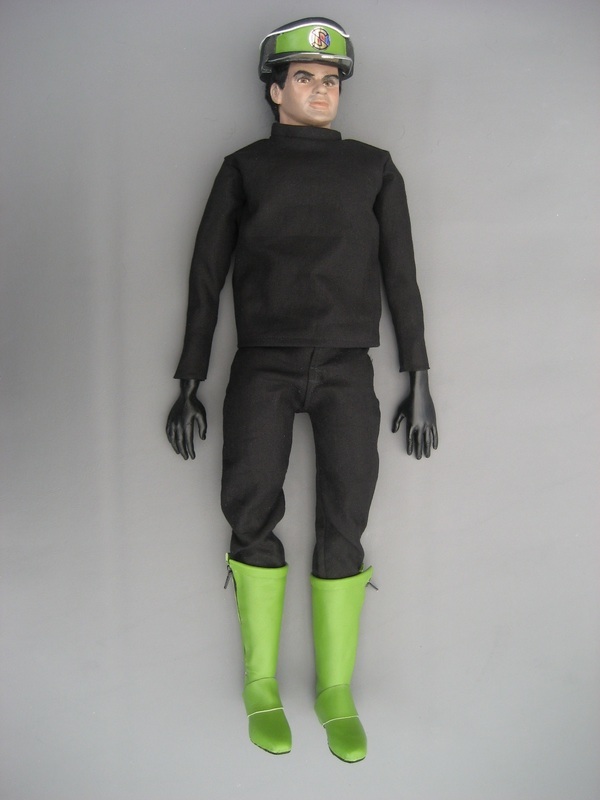 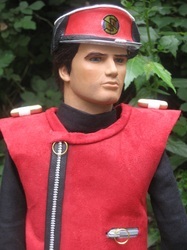 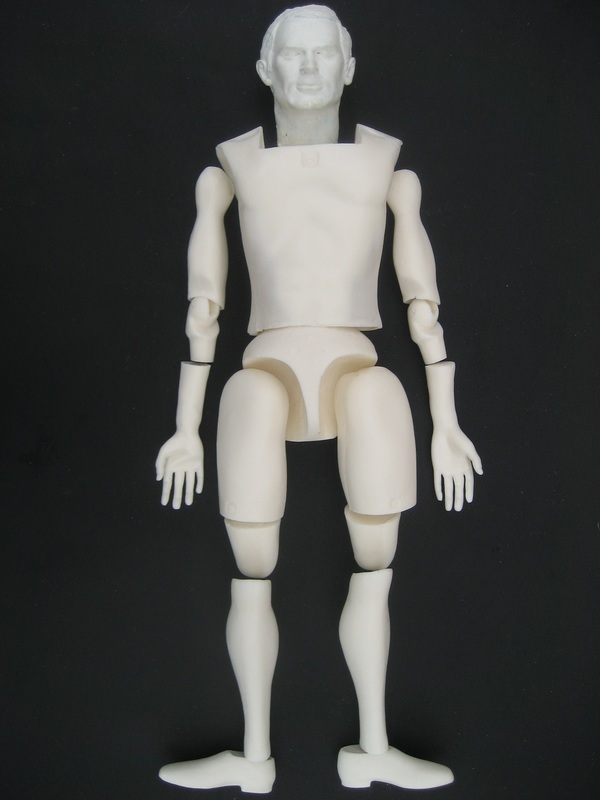 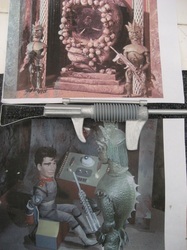 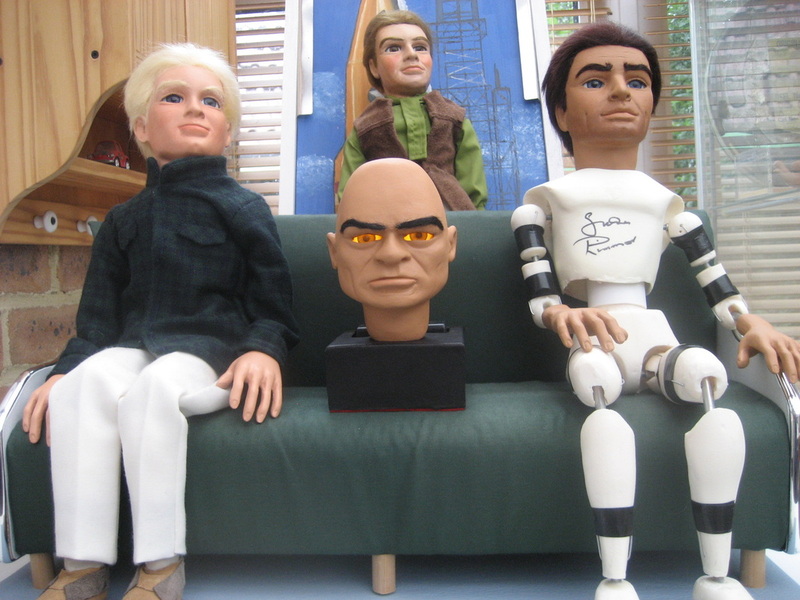 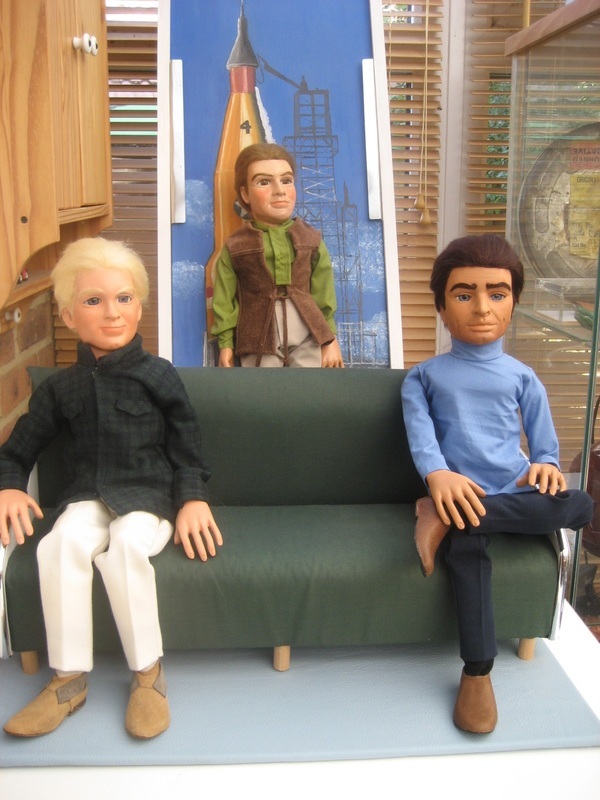 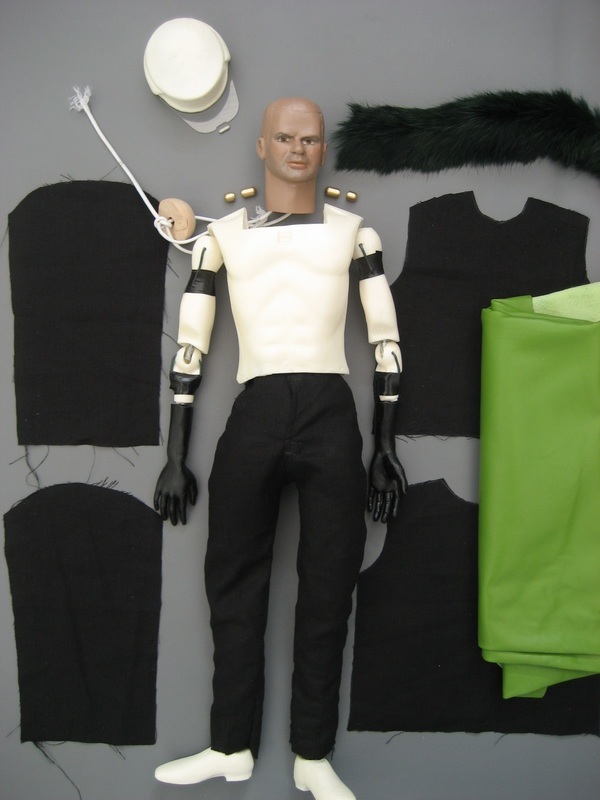 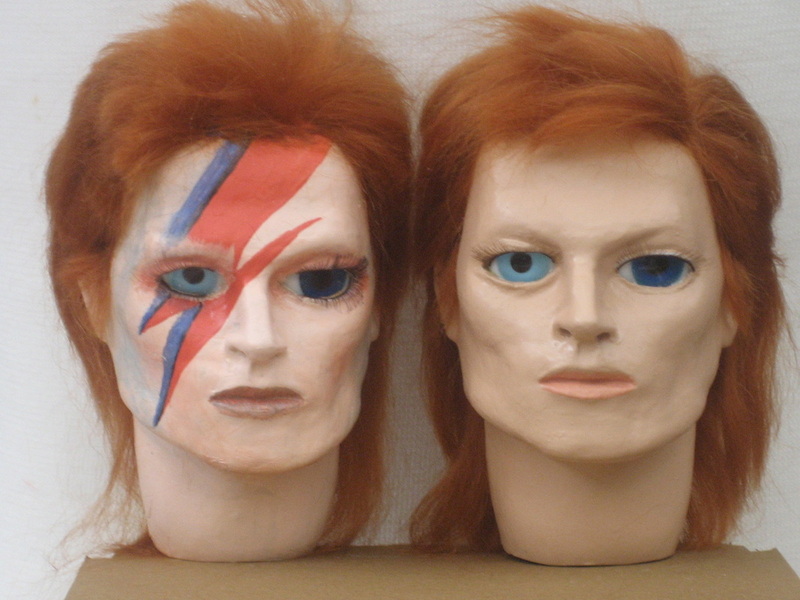 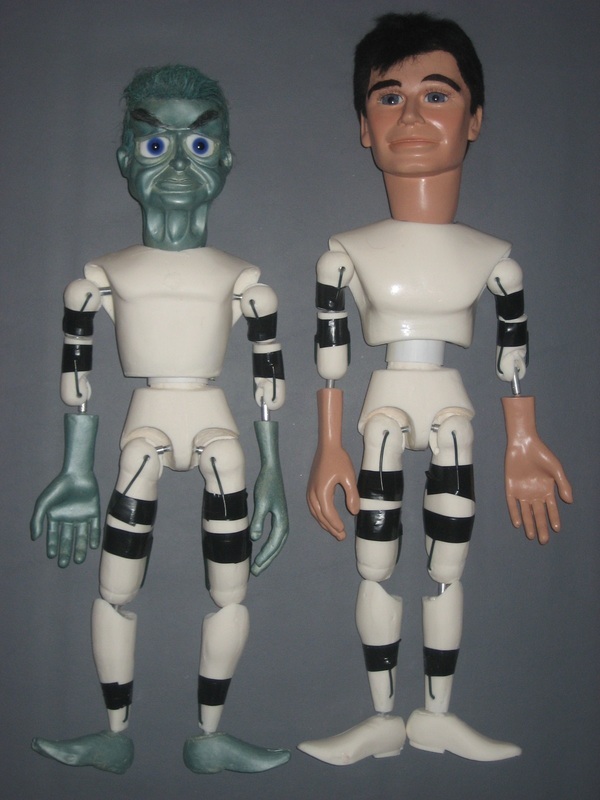 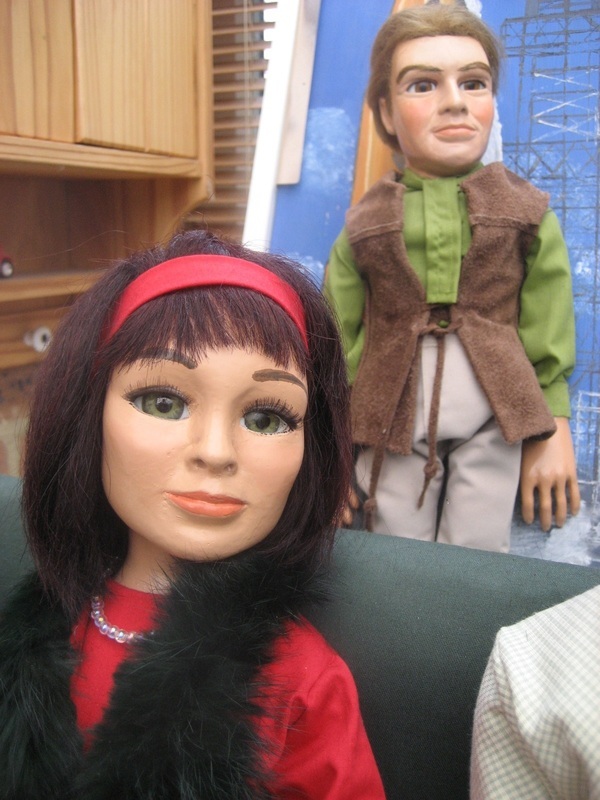 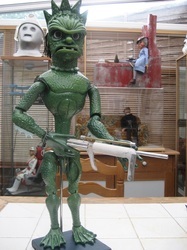 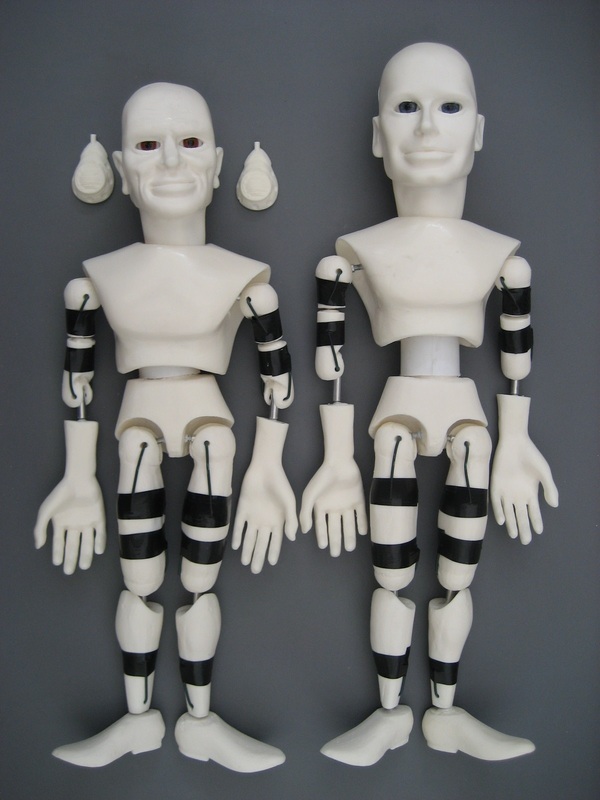 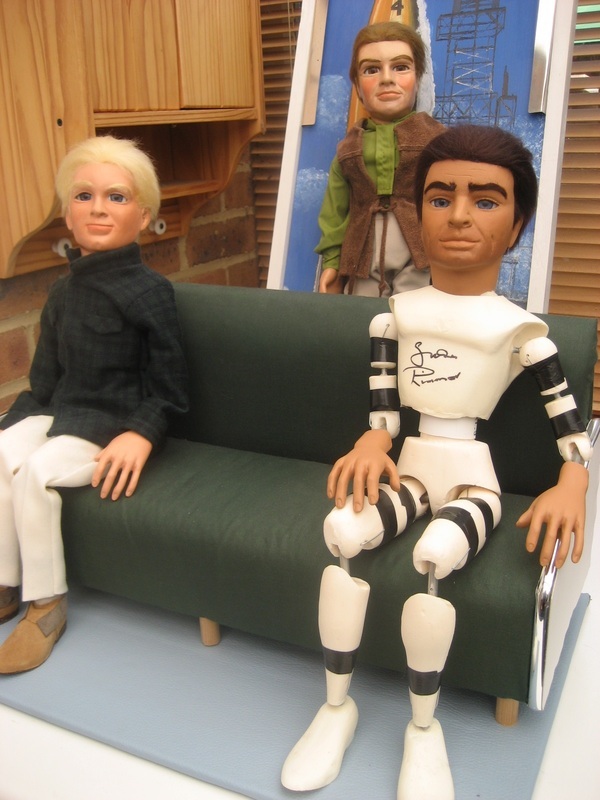 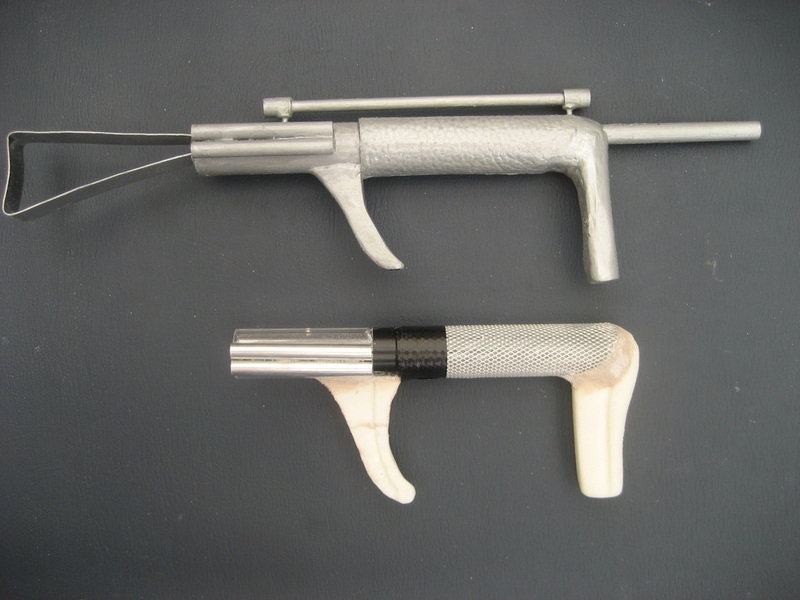 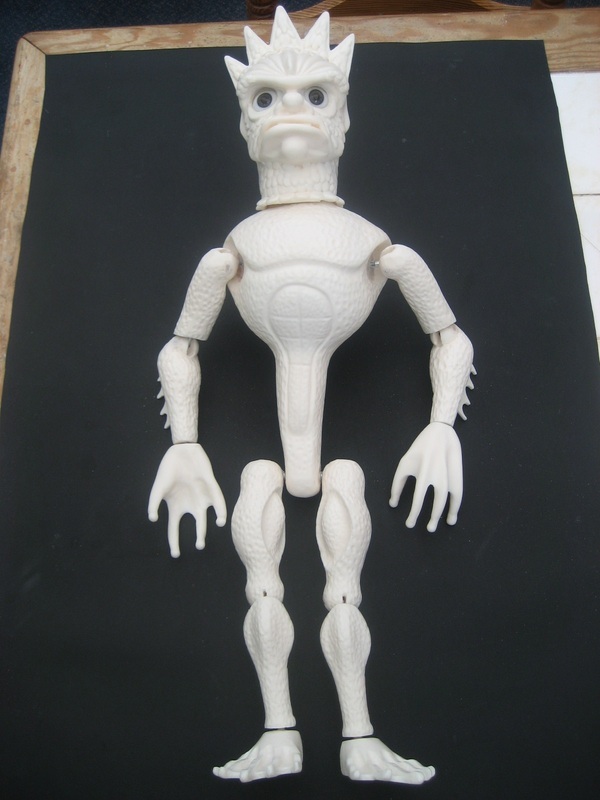 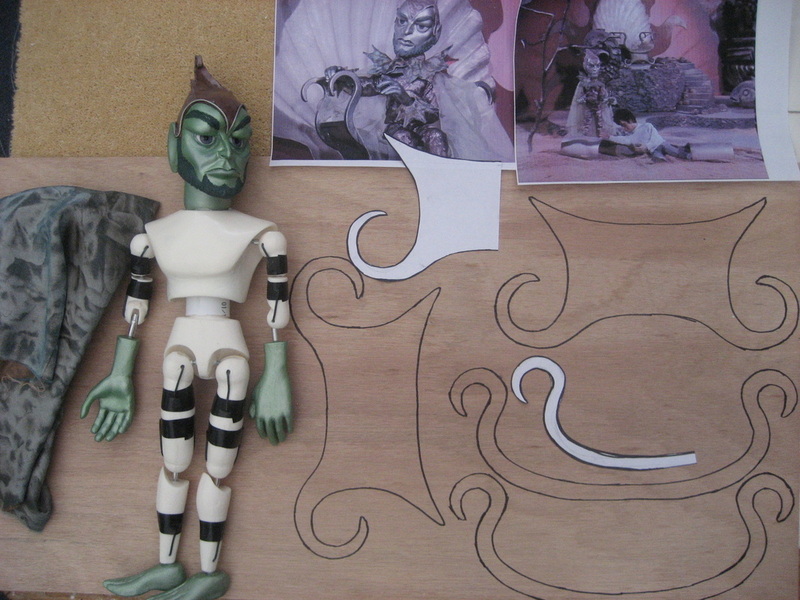 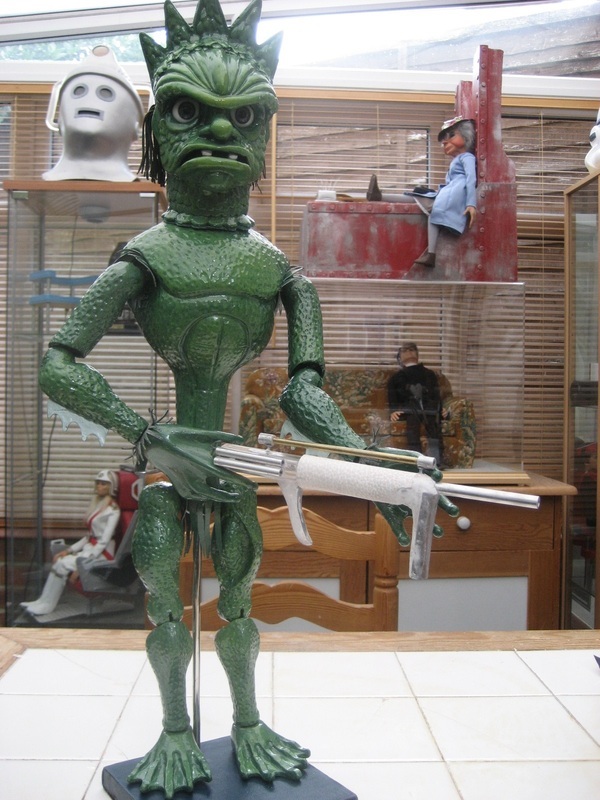 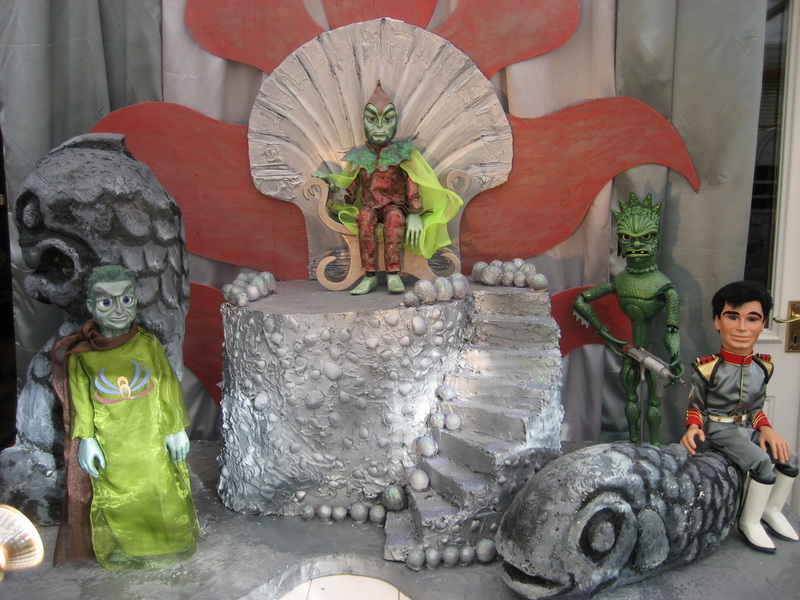 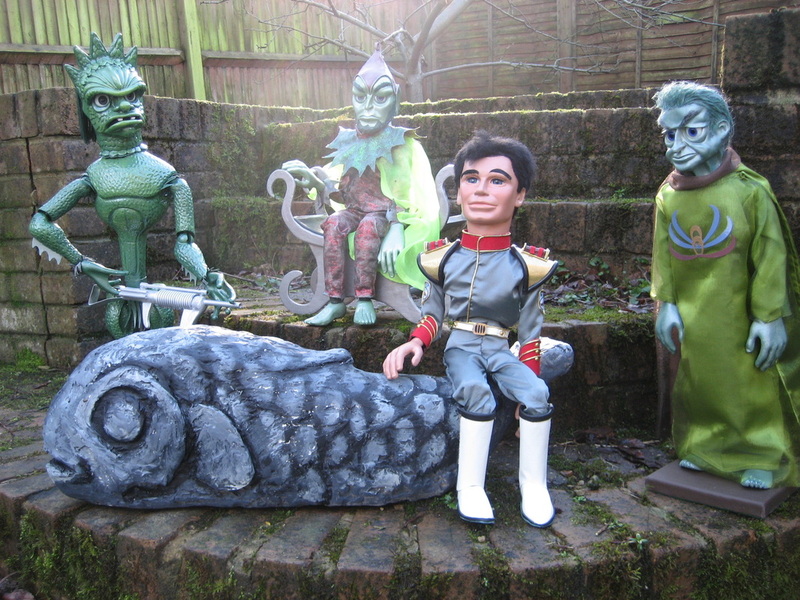 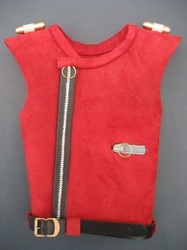 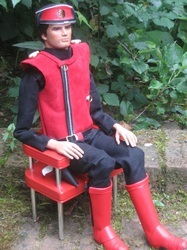 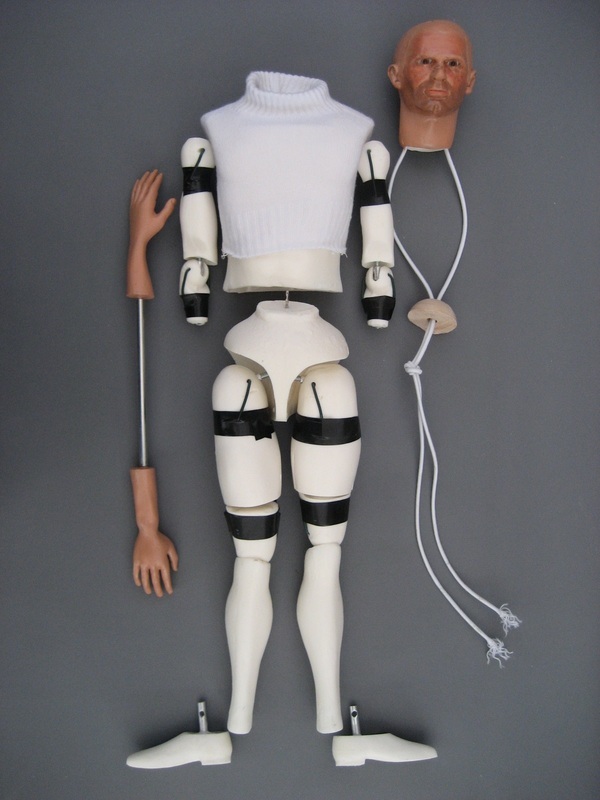 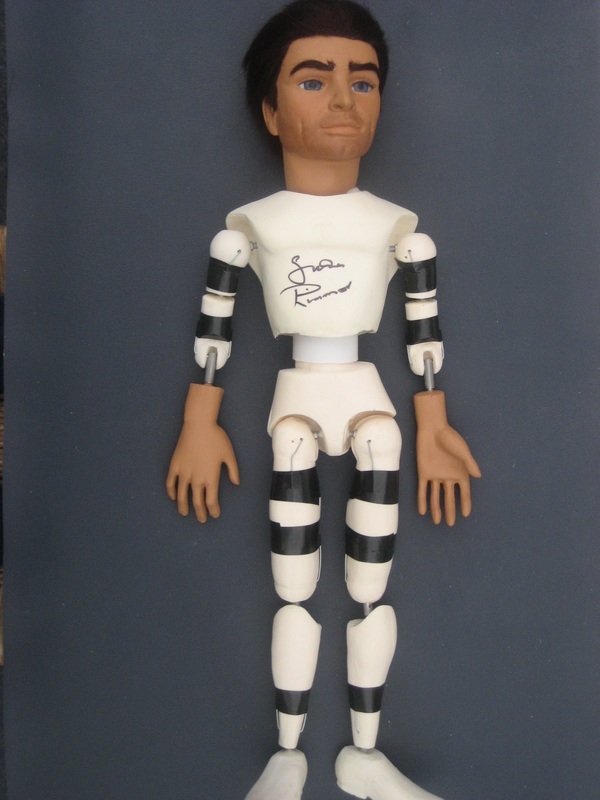 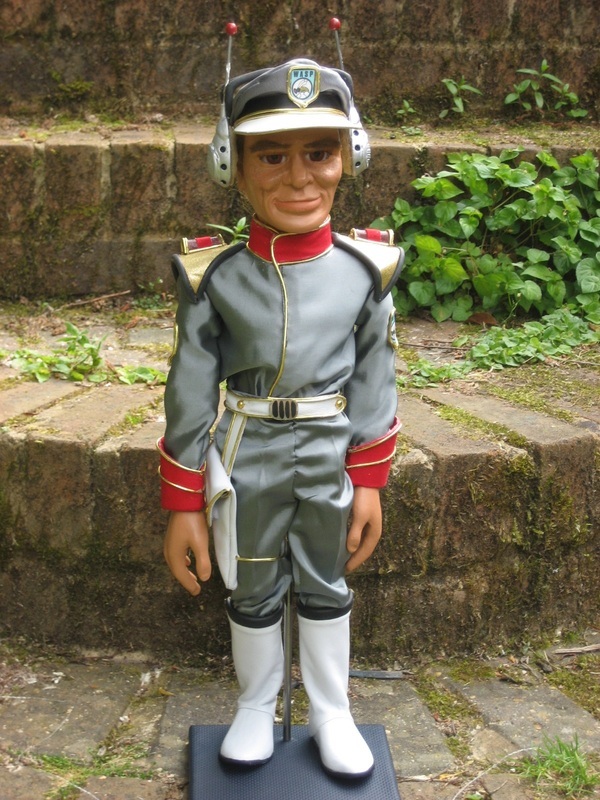 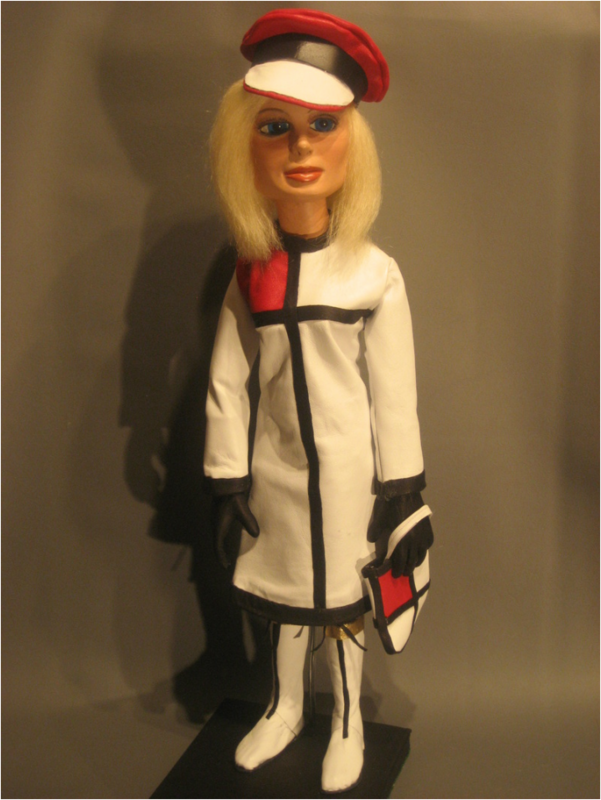 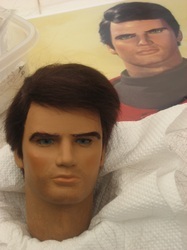 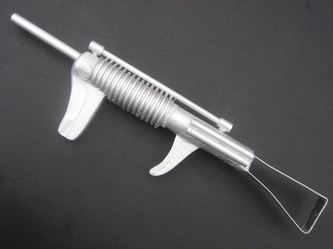 The original puppet-scale set from Stingray. 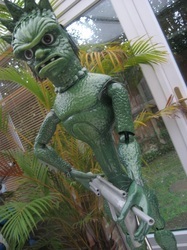 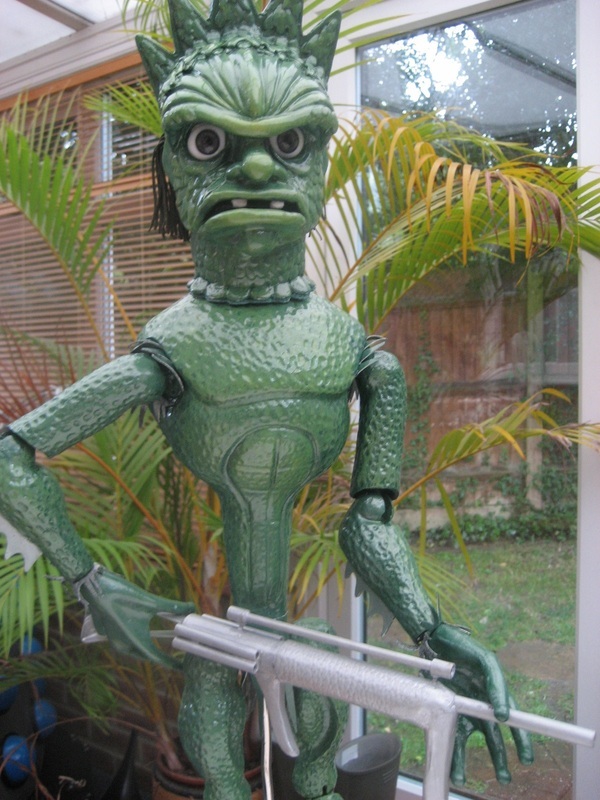 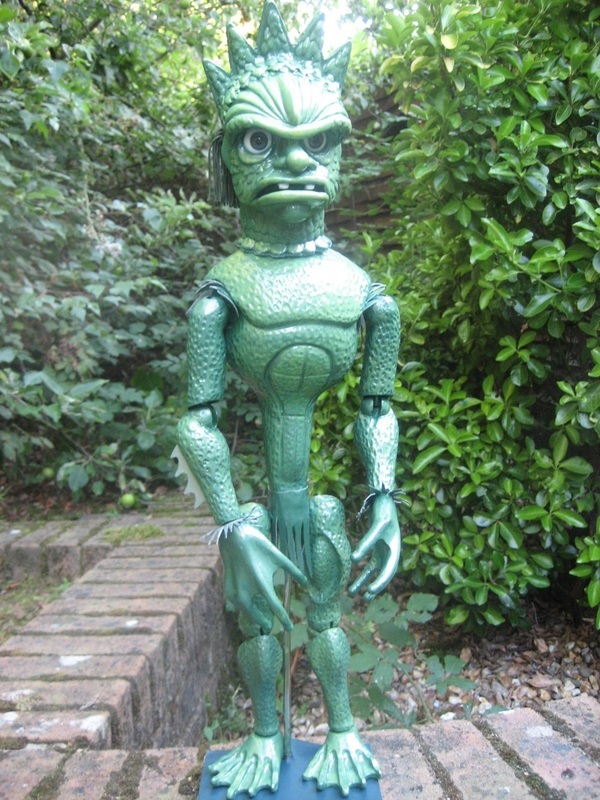 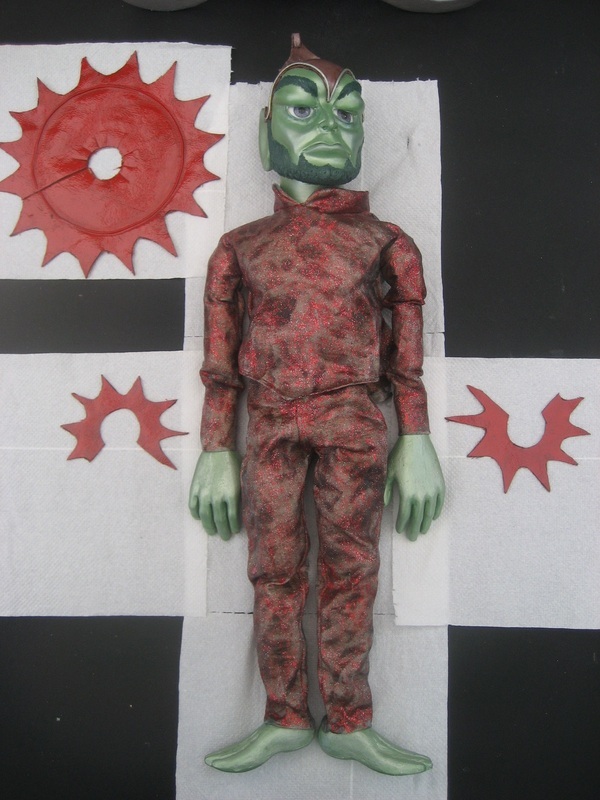 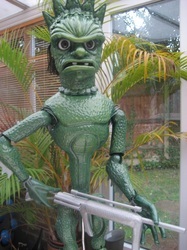 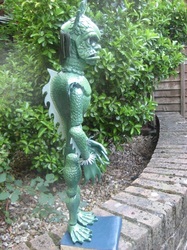 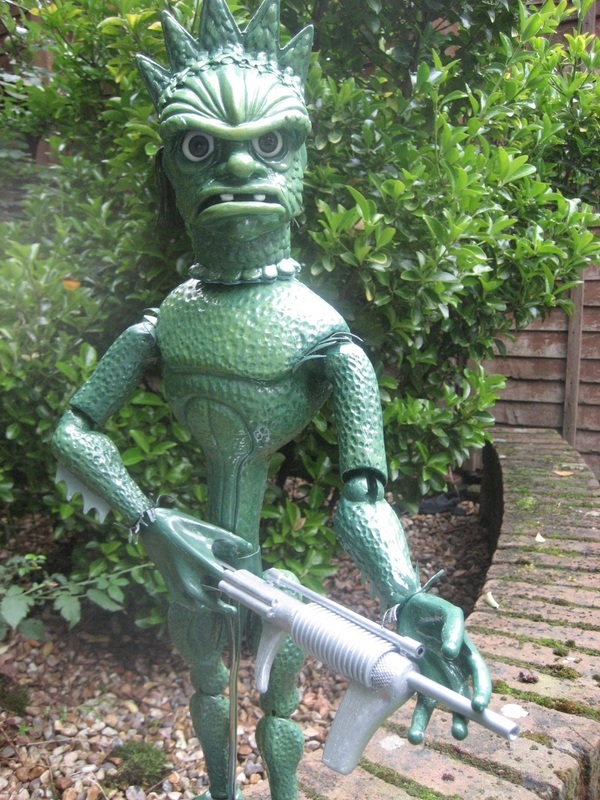 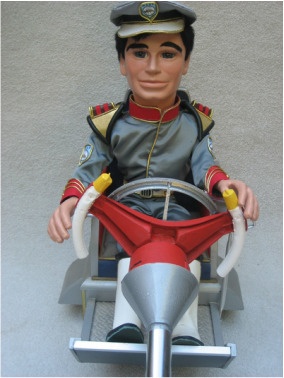 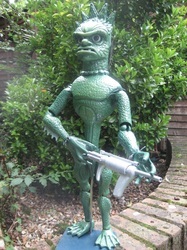 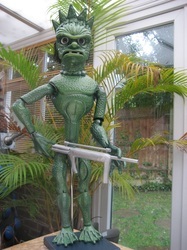 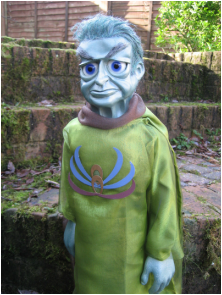 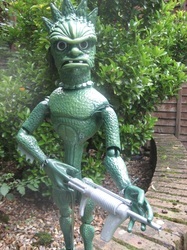 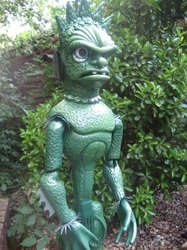 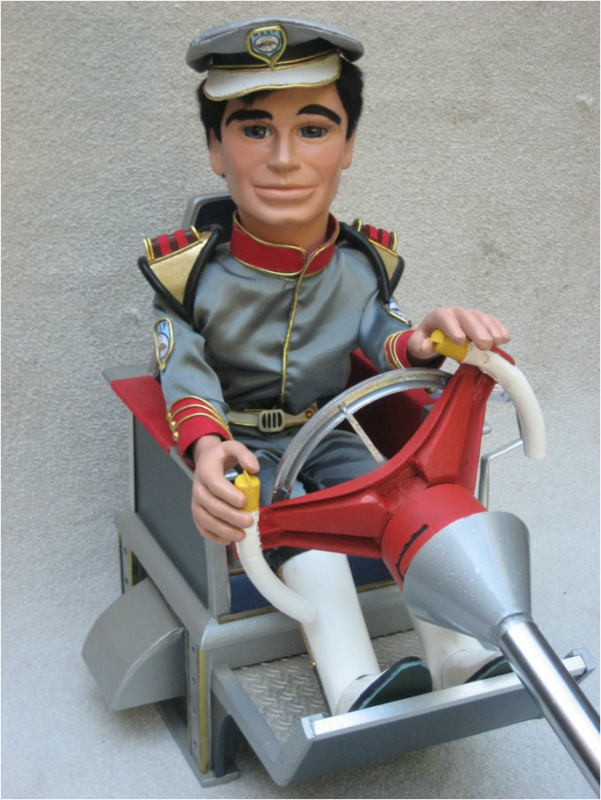 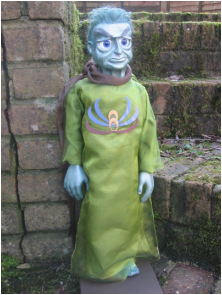 My replica Troy Tempest puppet with his Stingray control wheel which I made using my resin casts - copies of a cut-down vintage toy, identical to the one used by Gerry Anderson's prop-makers when Stingray was being filmed back in 1963. 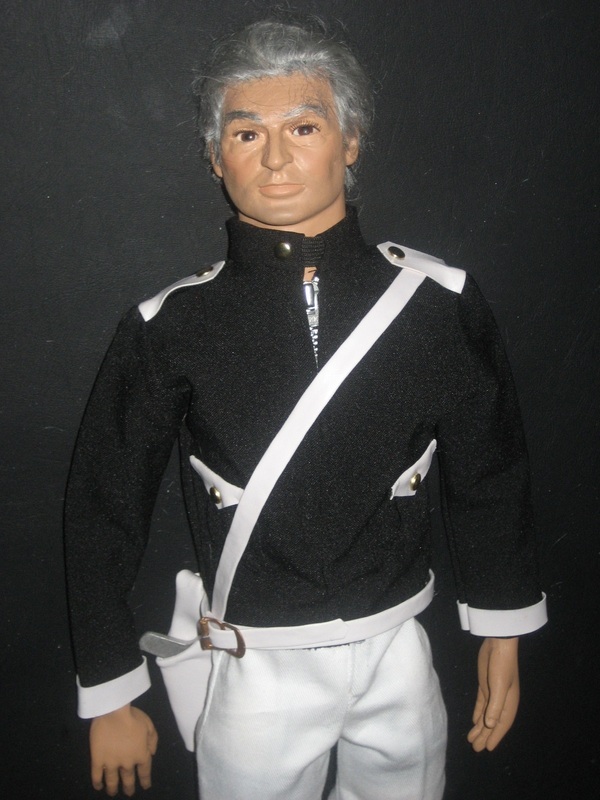 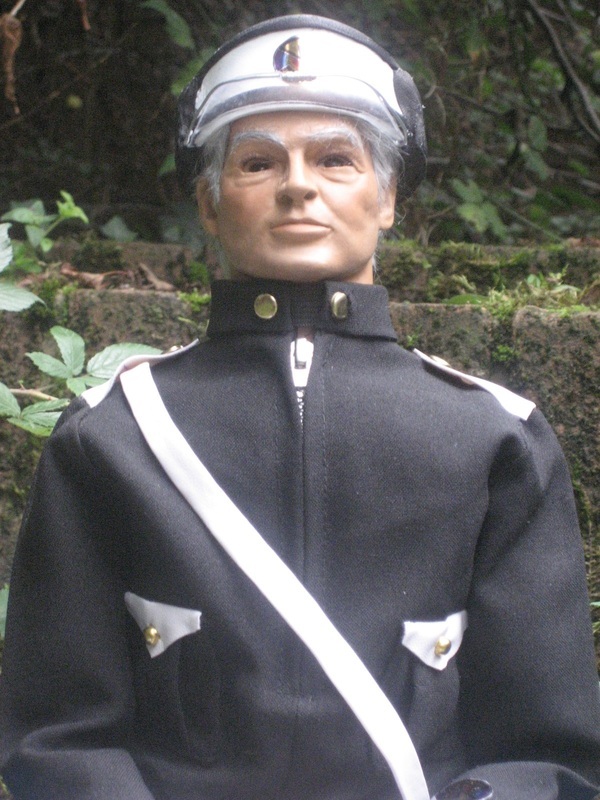 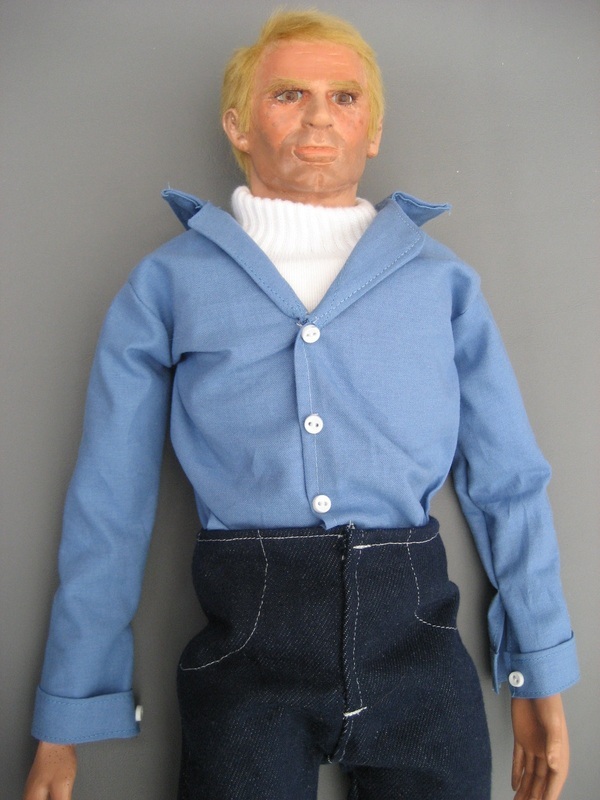 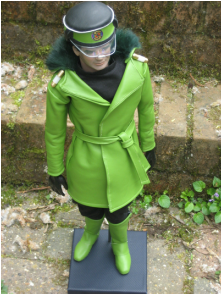 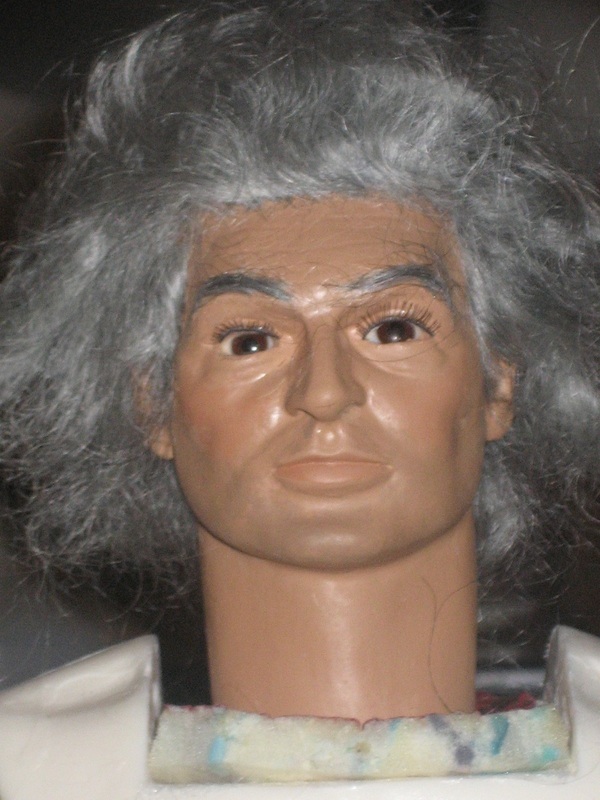 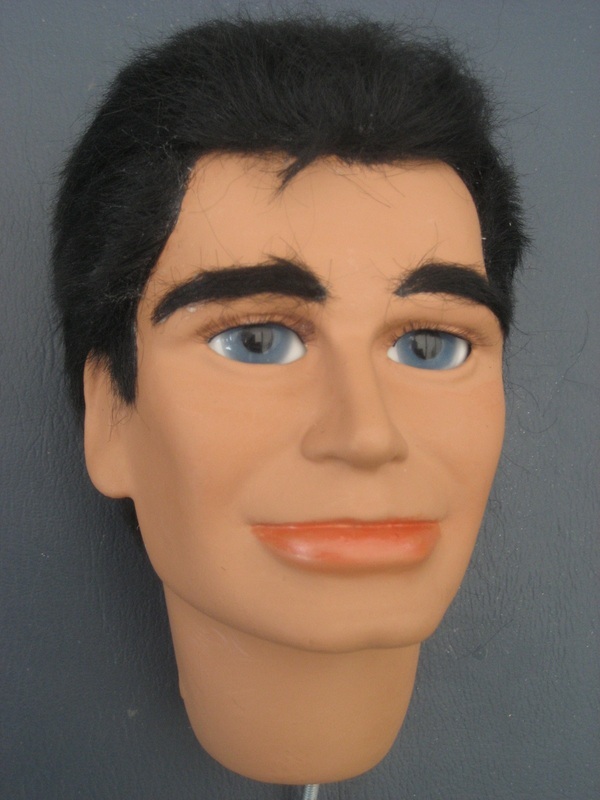 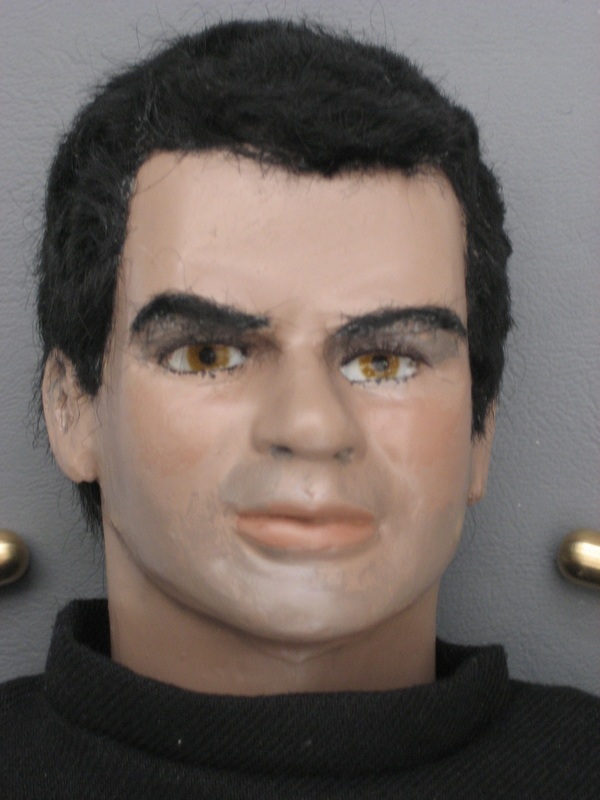 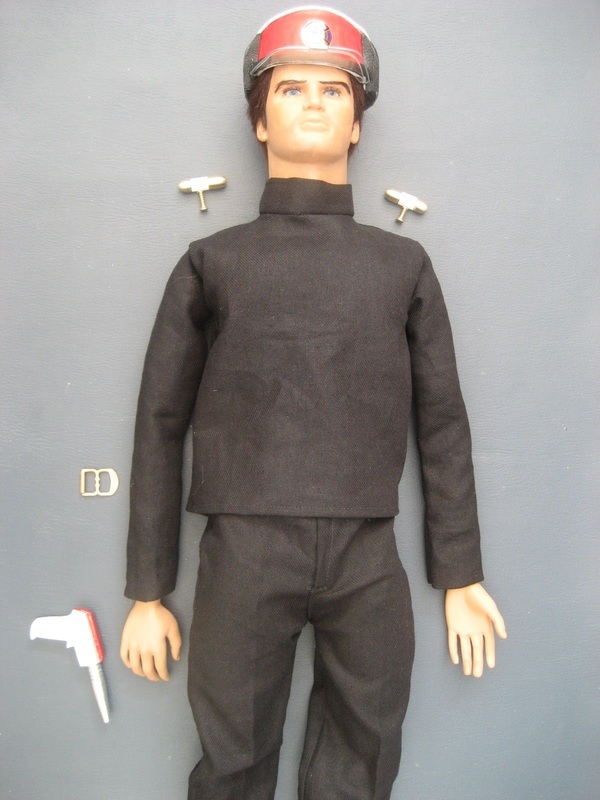 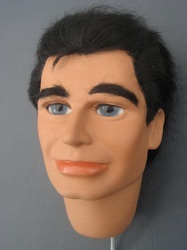 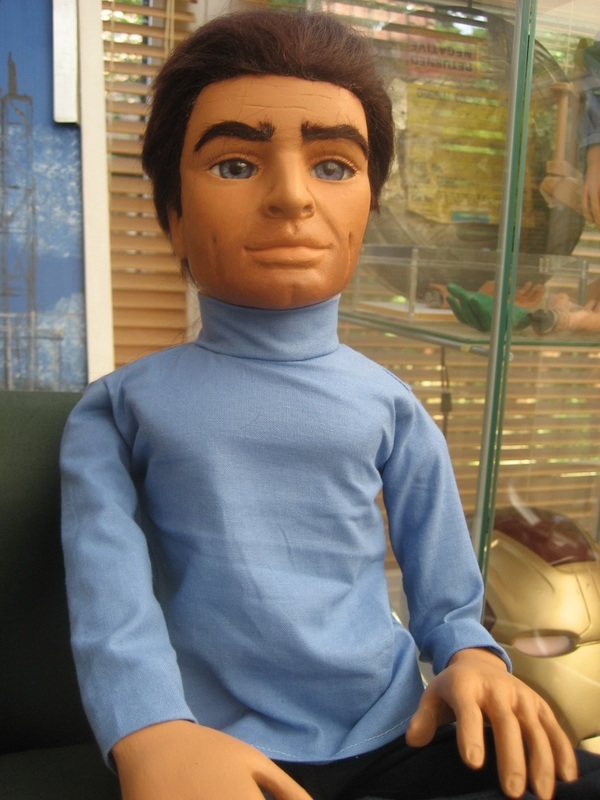 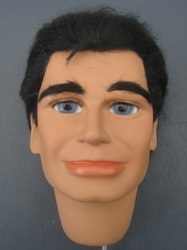 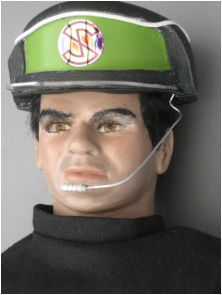 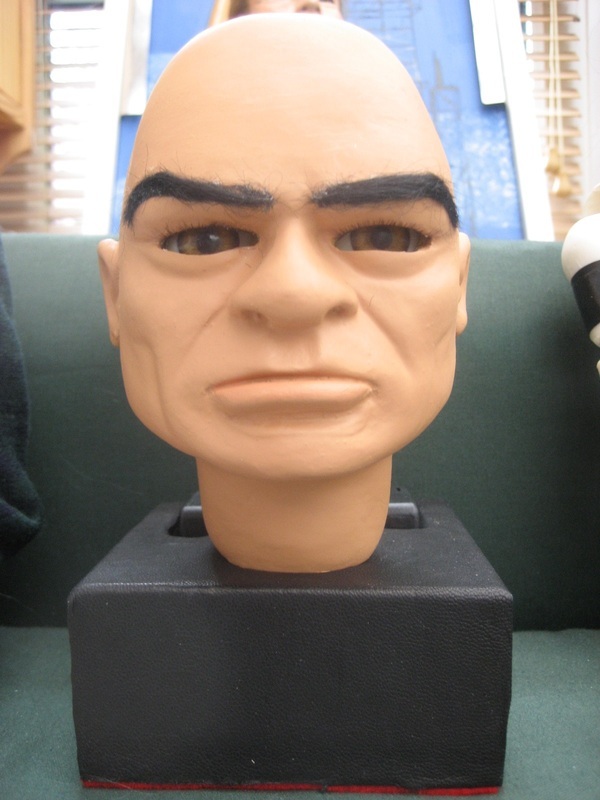 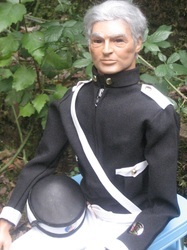 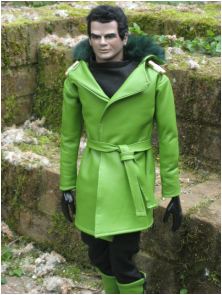 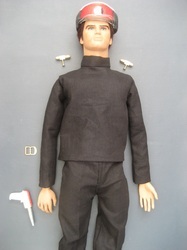 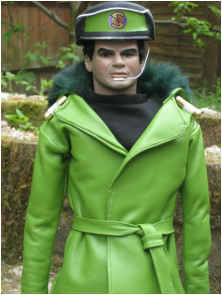 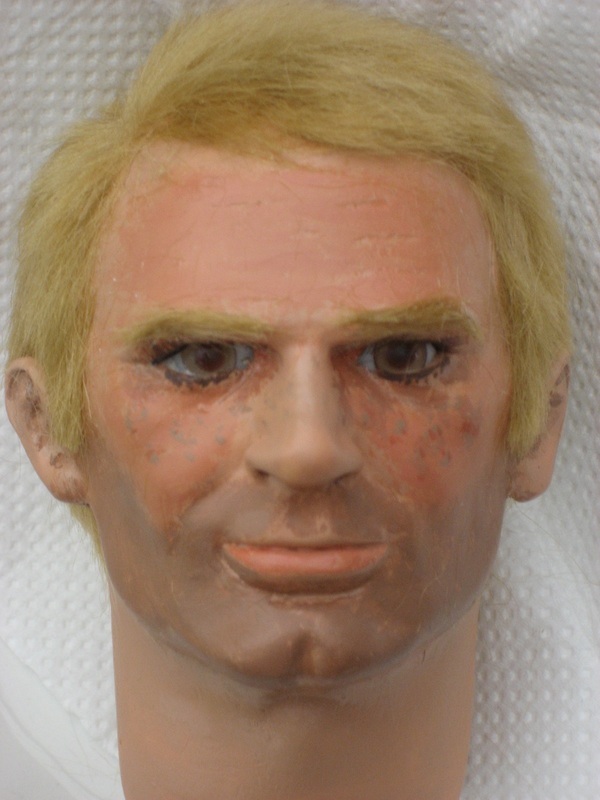 MATTHEW HARDING from THE SECRET SERVICE (1969) - The very last Supermarionation series. 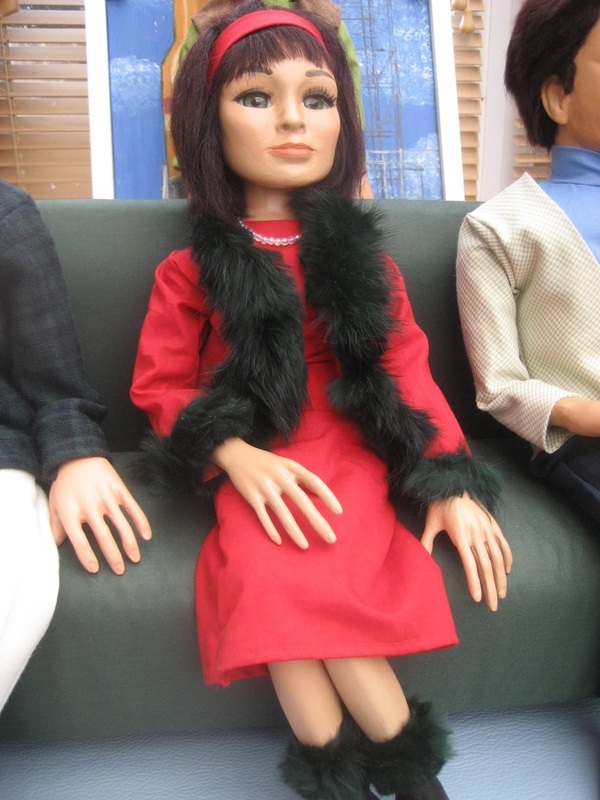 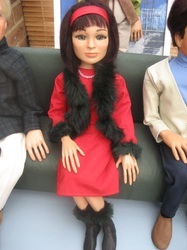 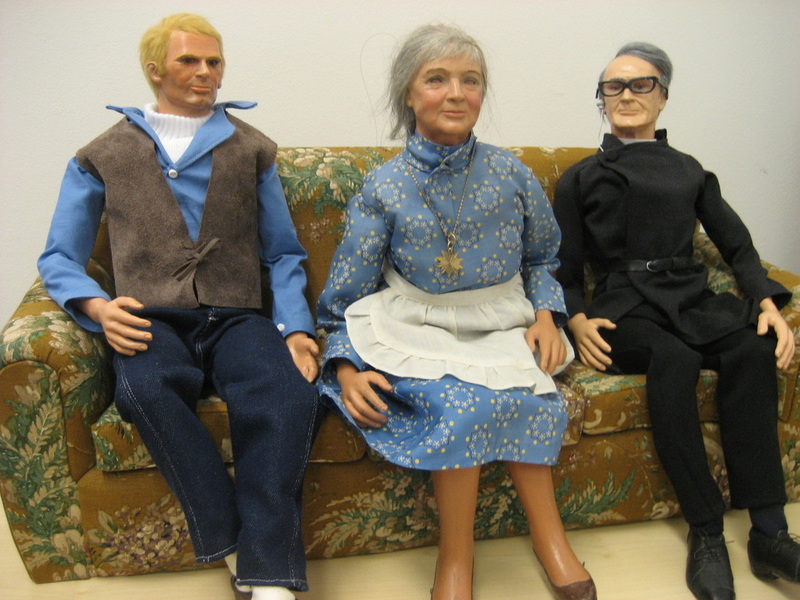 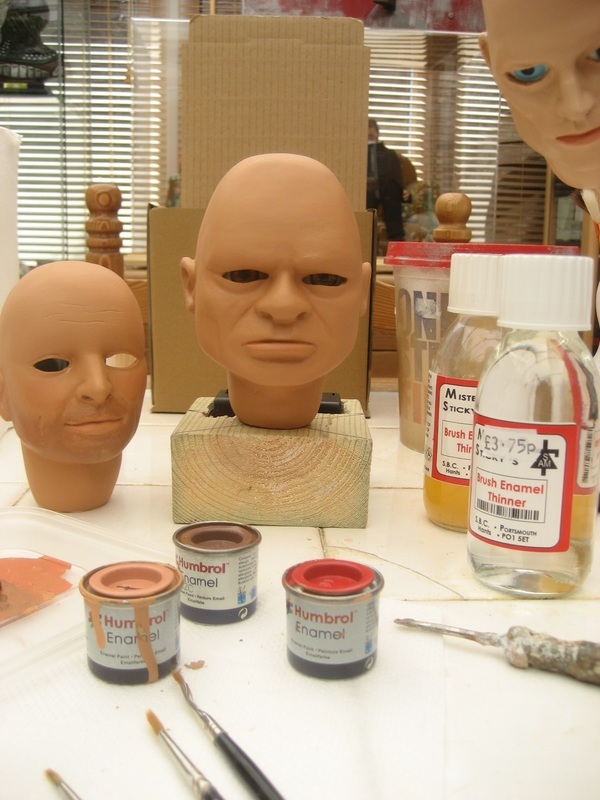 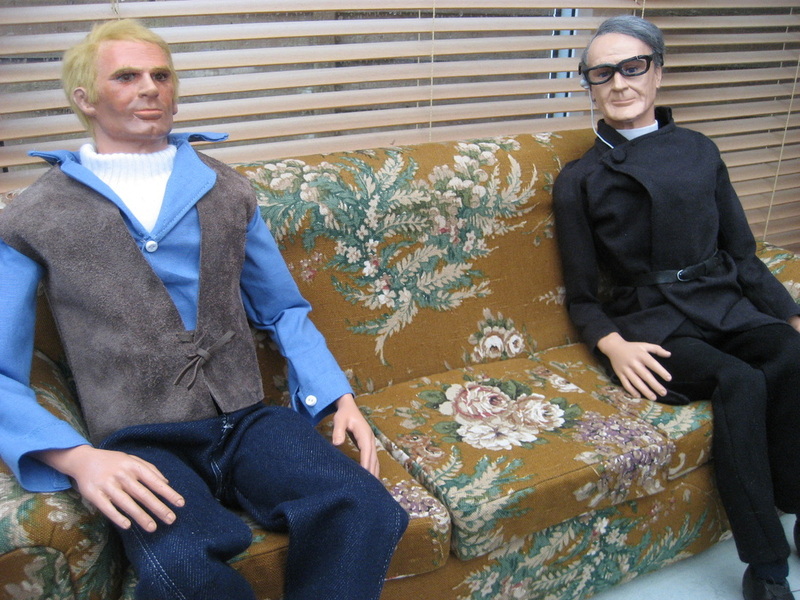 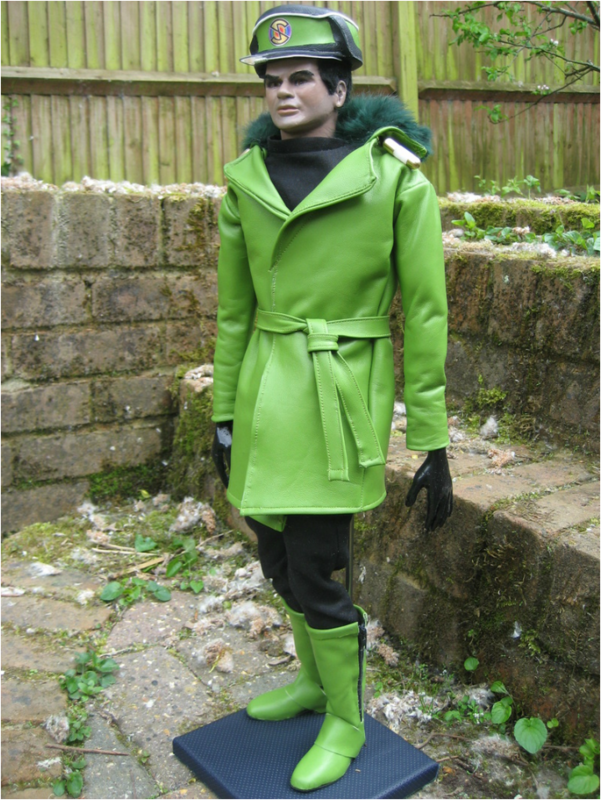 In April 2014 I took my replicas of Matthew Harding and Father Unwin along with the original sofa from The Secret Service up to The Victoria and Albert Museum of Childhood in London for a reunion with the original Mrs Appleby puppet which is owned and held in storage by the museum. 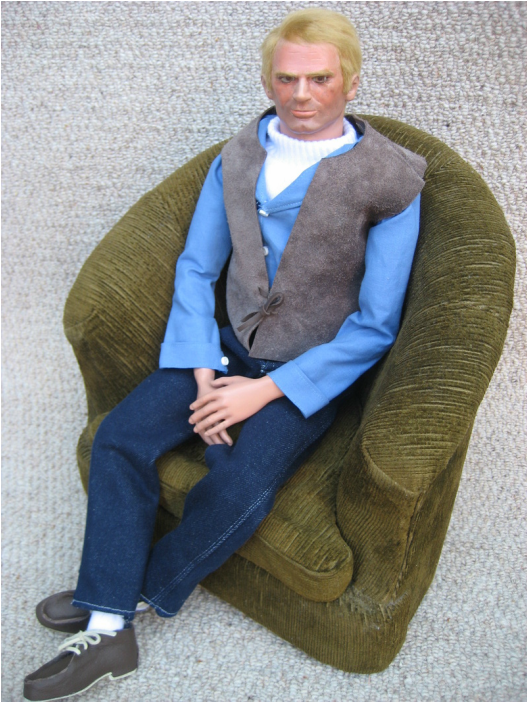 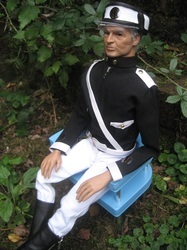 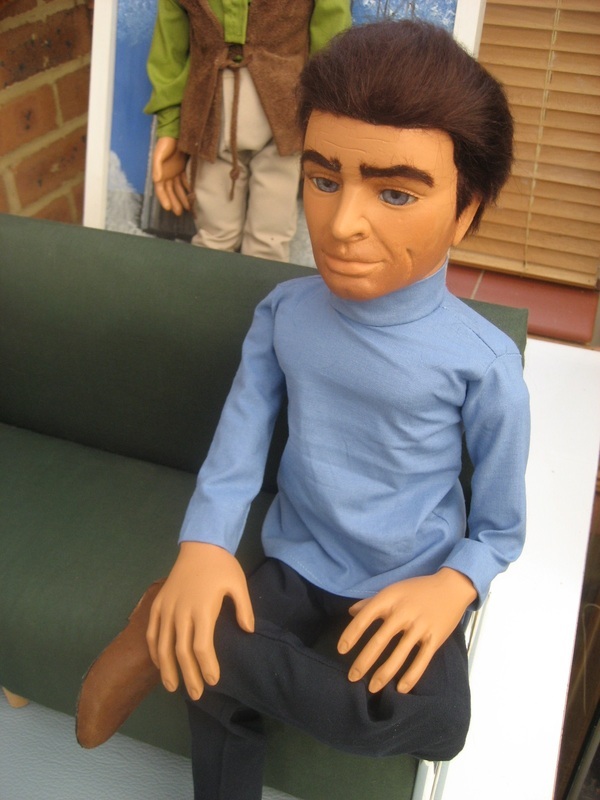 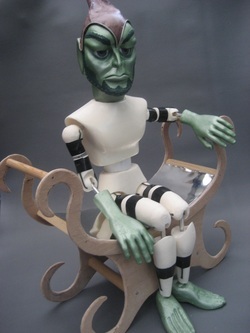 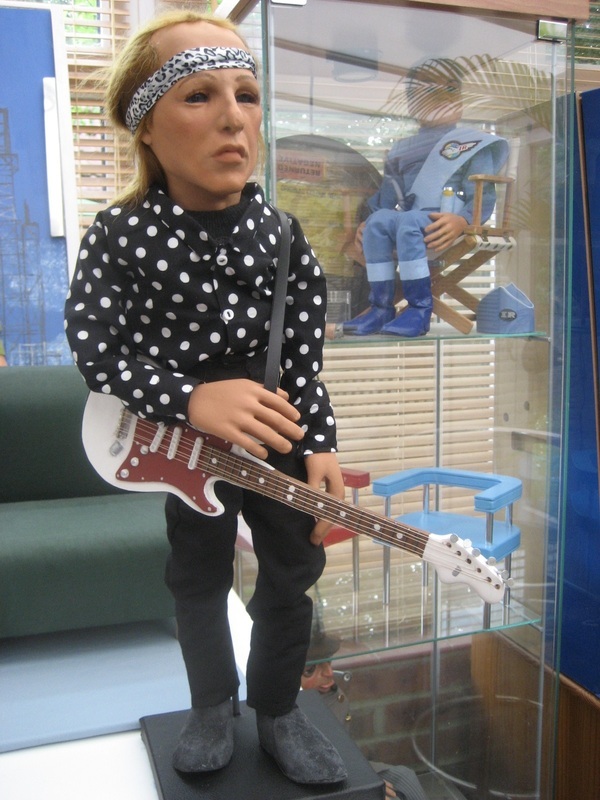 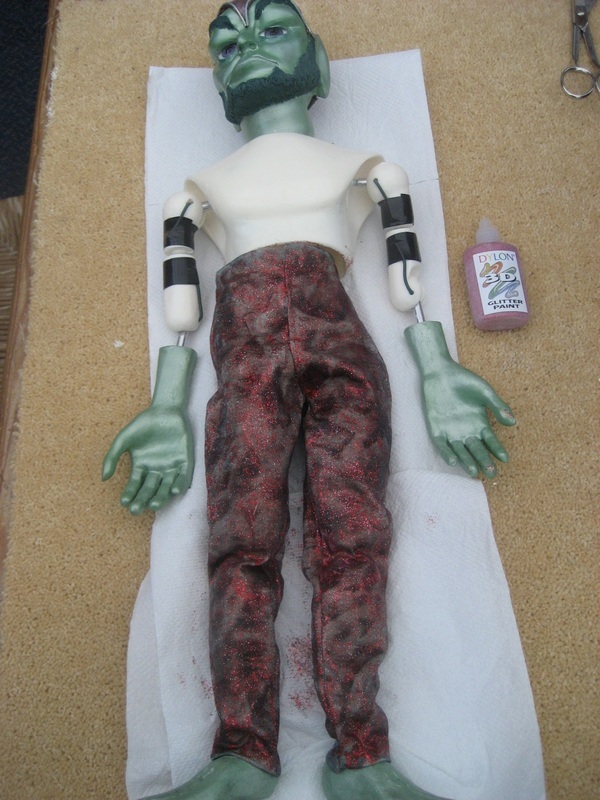 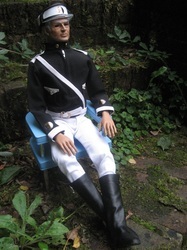 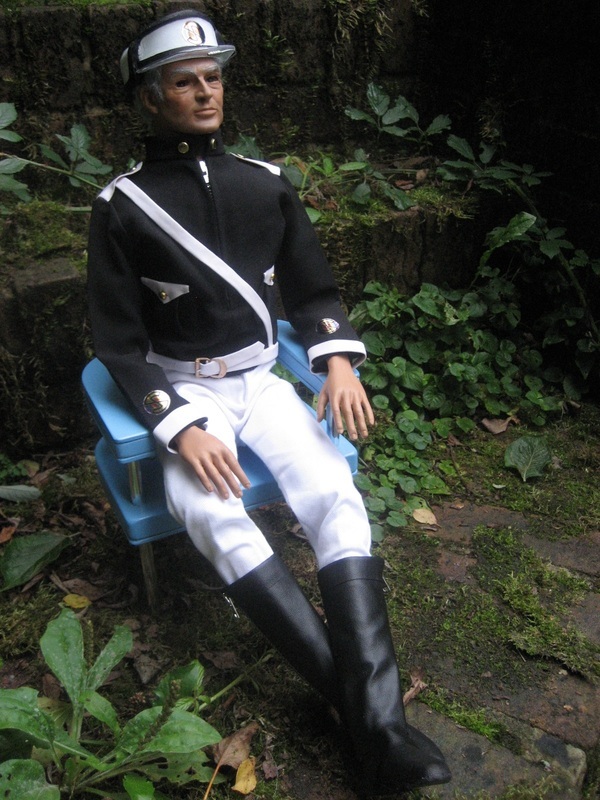 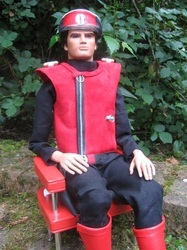 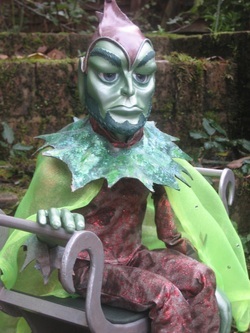 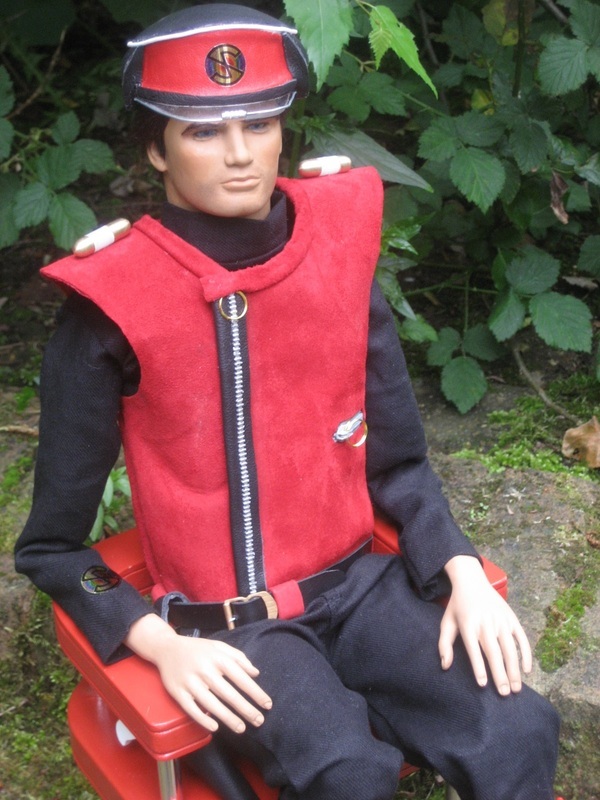 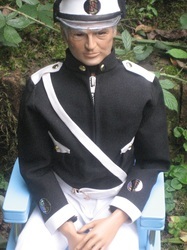 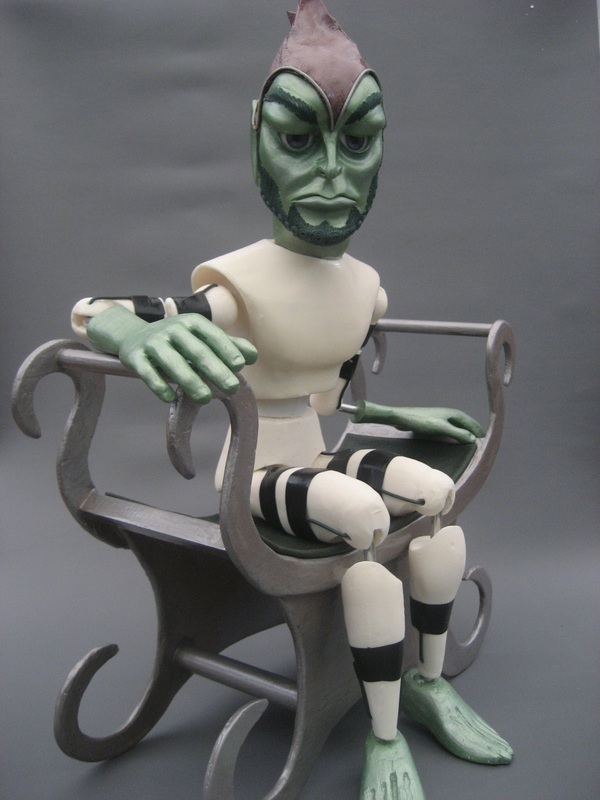 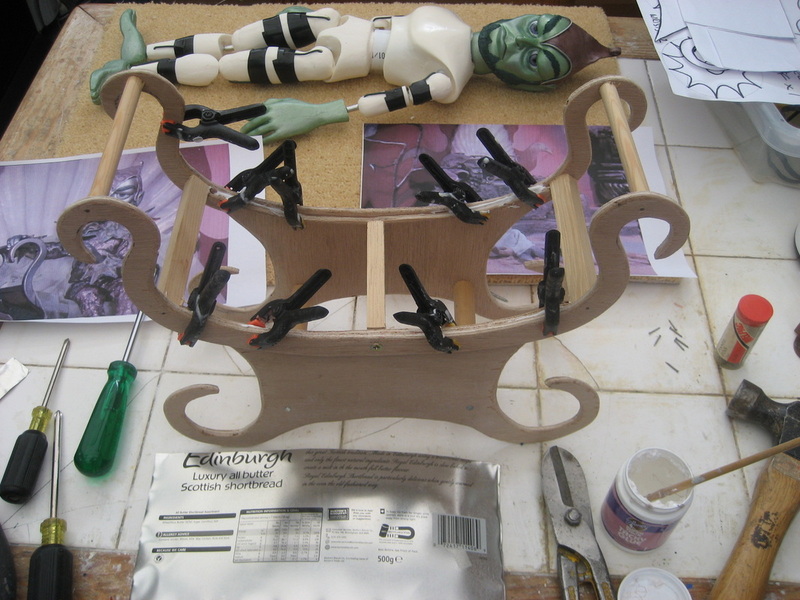 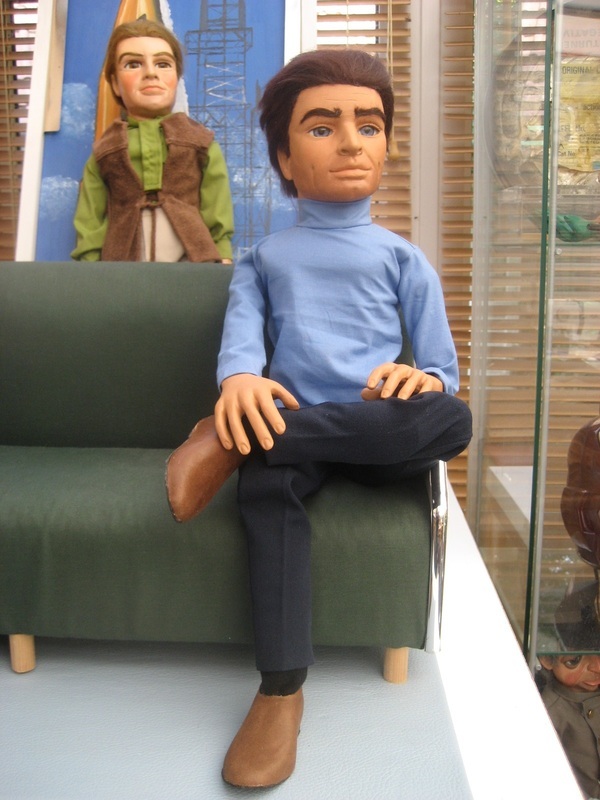 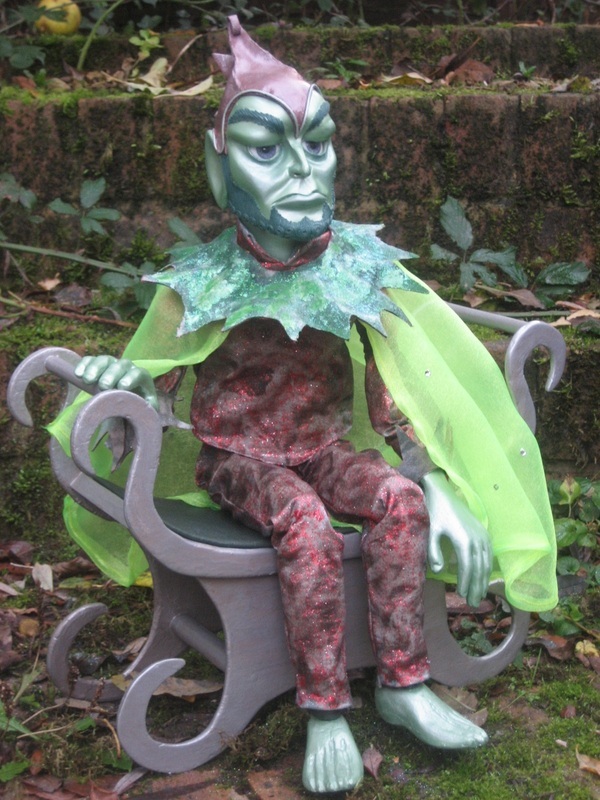 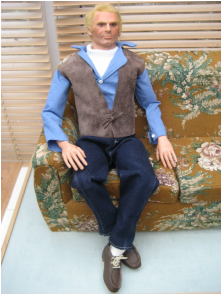 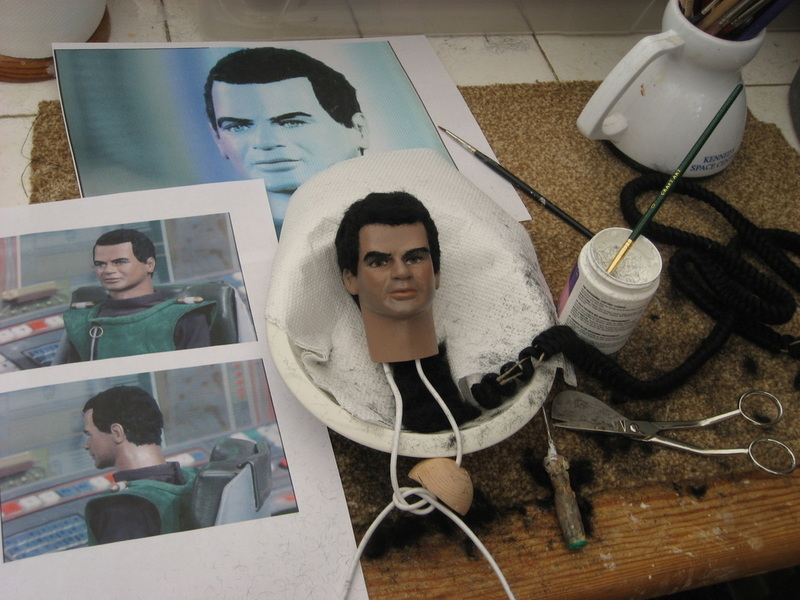 As of June 2014 my replica Matthew puppet has an original screen-used armchair to sit in. 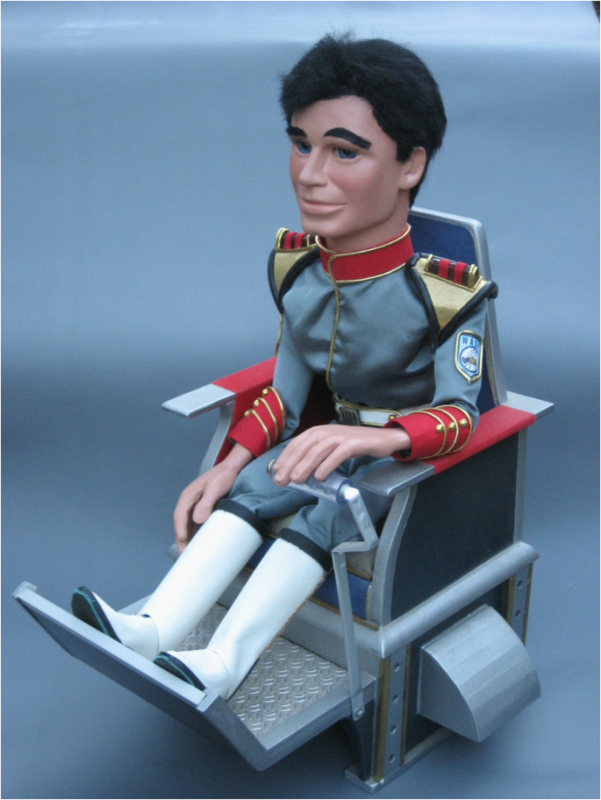 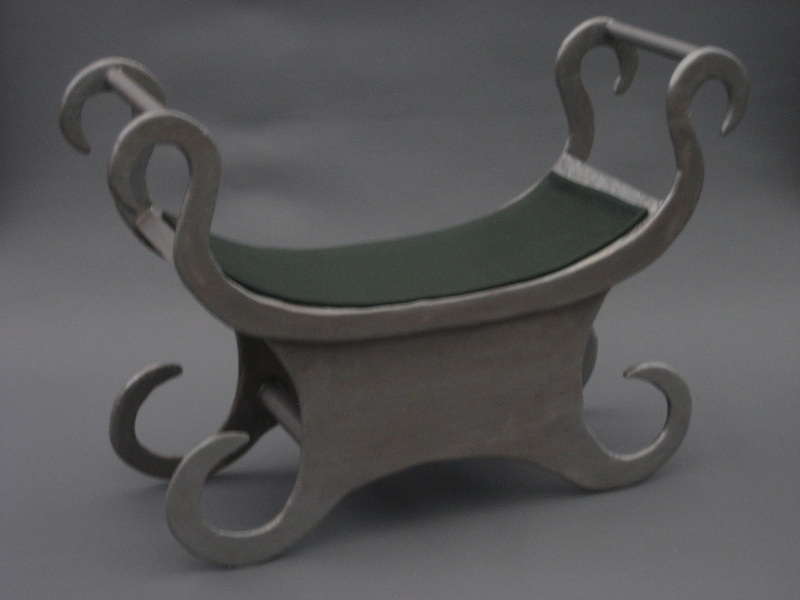 his chair was used in at least three episodes of The Secret Service, and the "real" Matthew sat in it in the episode 'Errand of Mercy'. 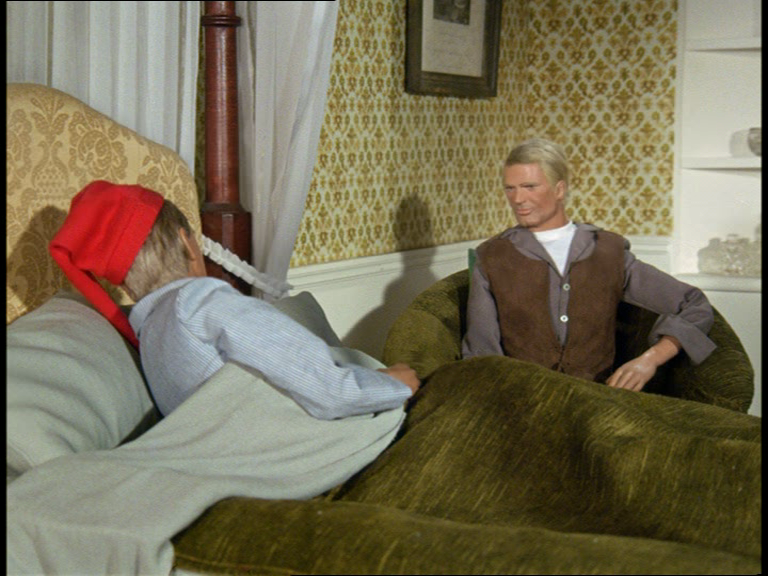 Here's a screen grab from 'Errand of Mercy' showing the "real" Matthew (wearing his other shirt - the brown one) sitting in the chair by the side of Father Unwin's sick-bed. 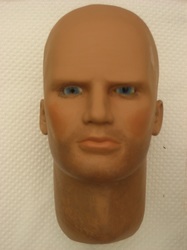 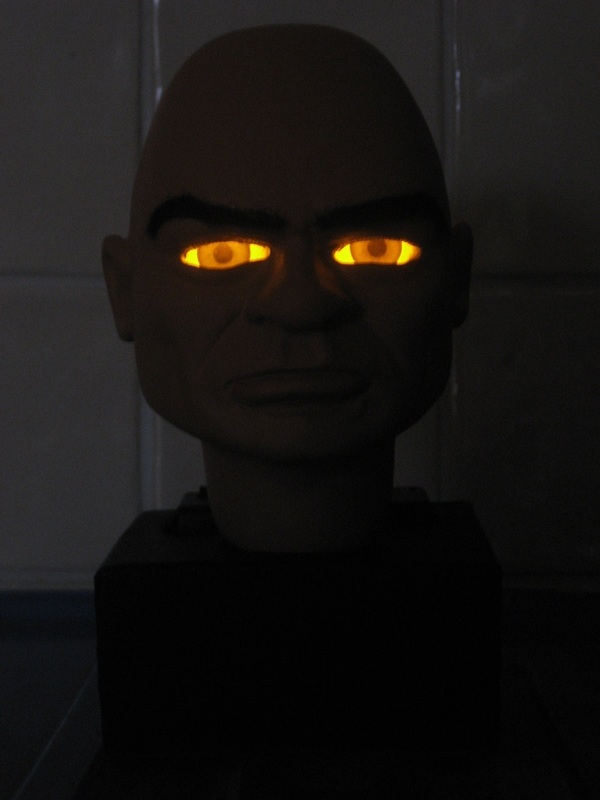 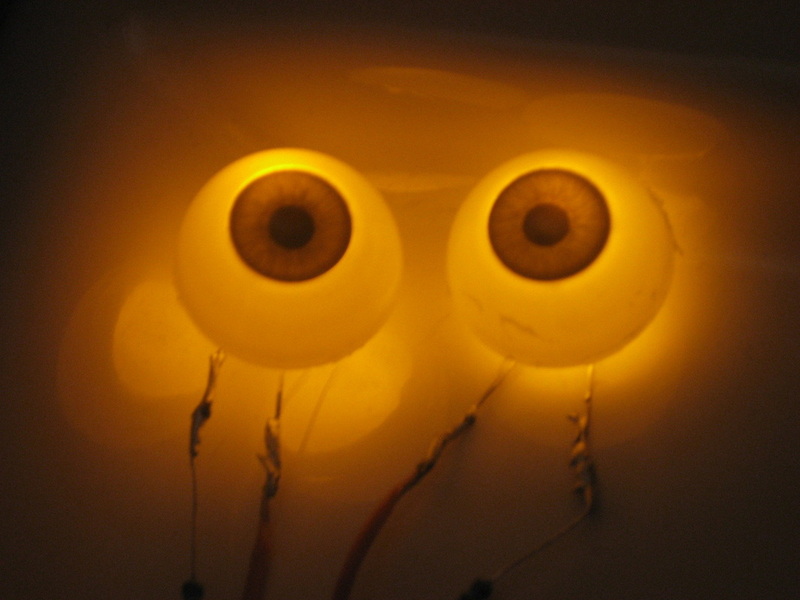 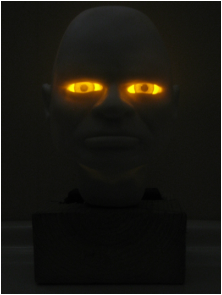 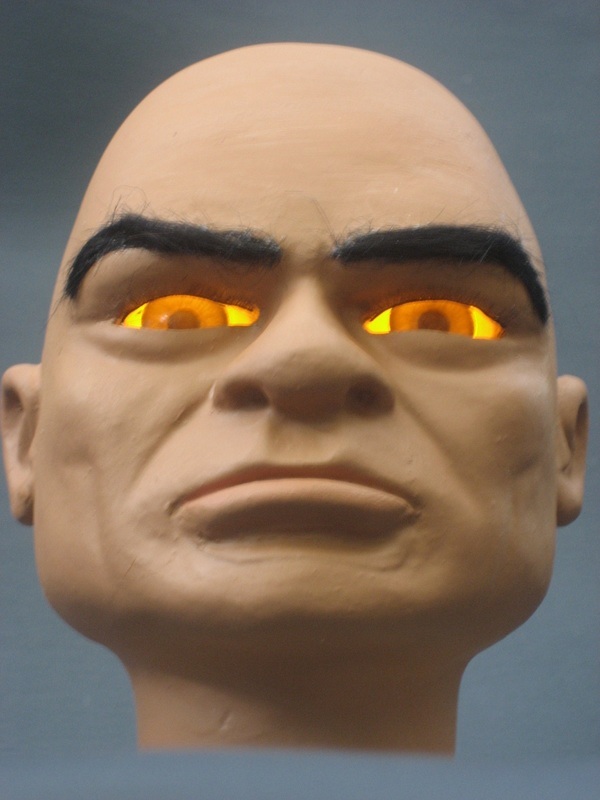 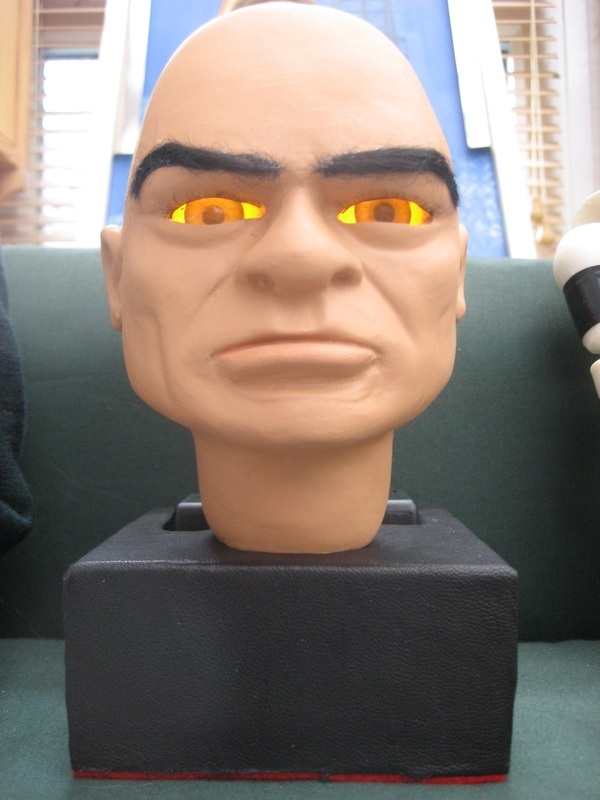 The Hood Head display with light-up eyes. 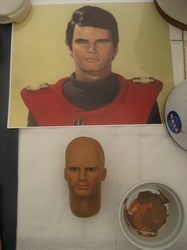 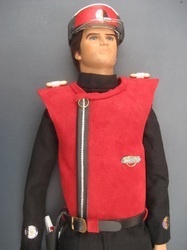 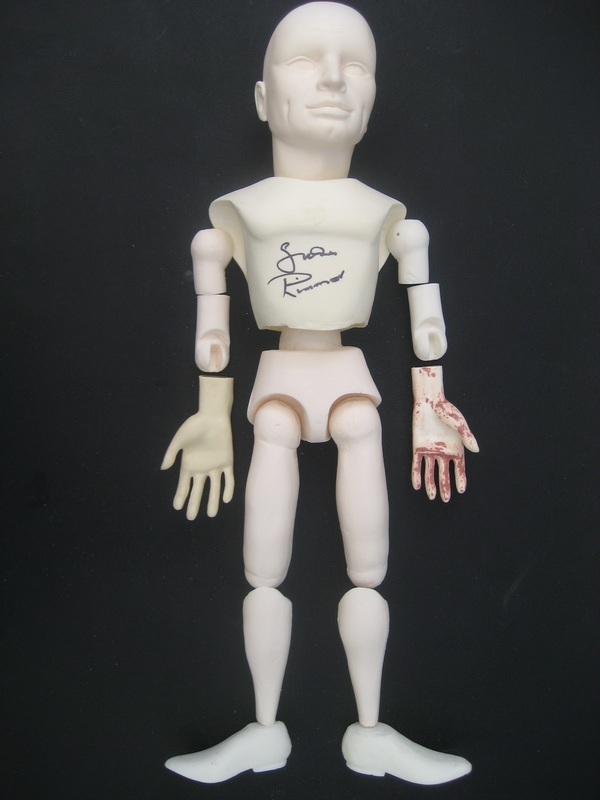 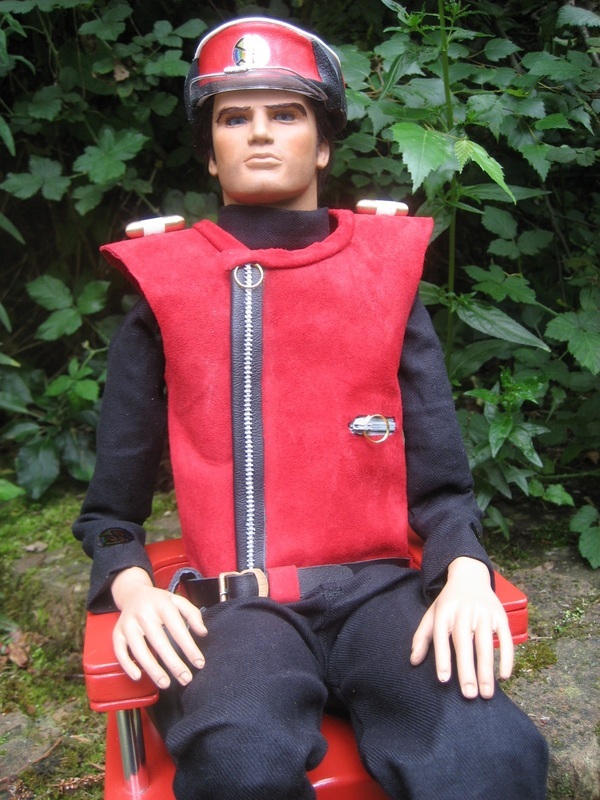 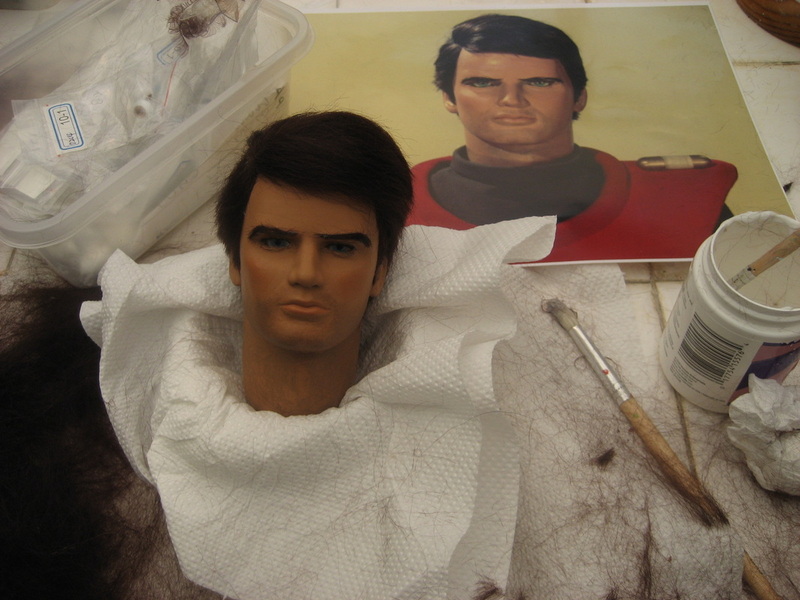 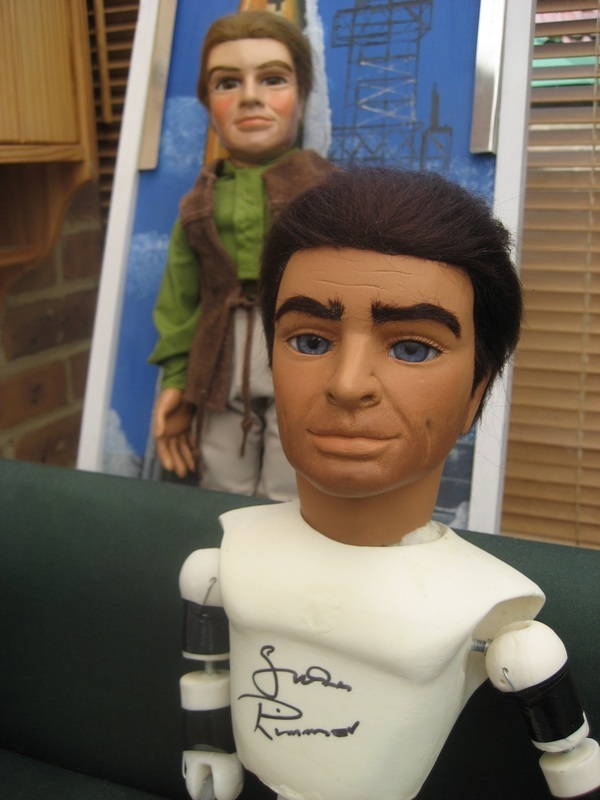 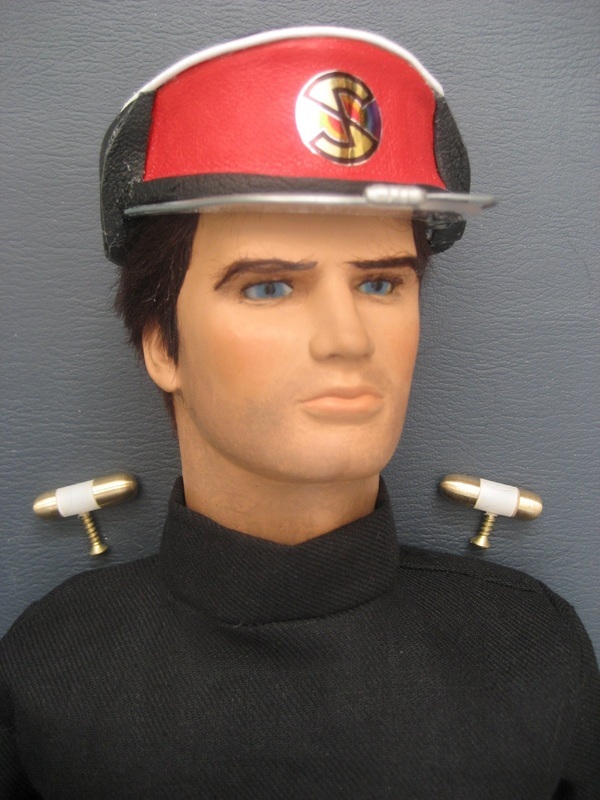 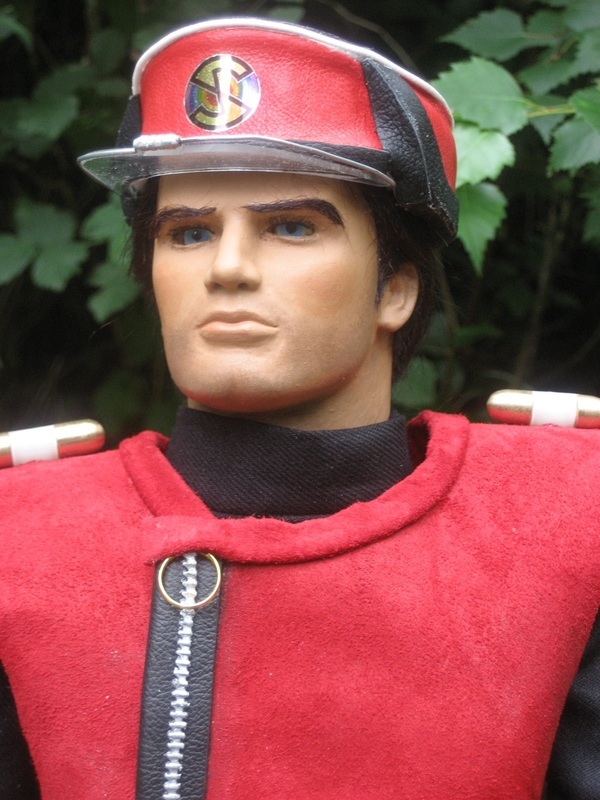 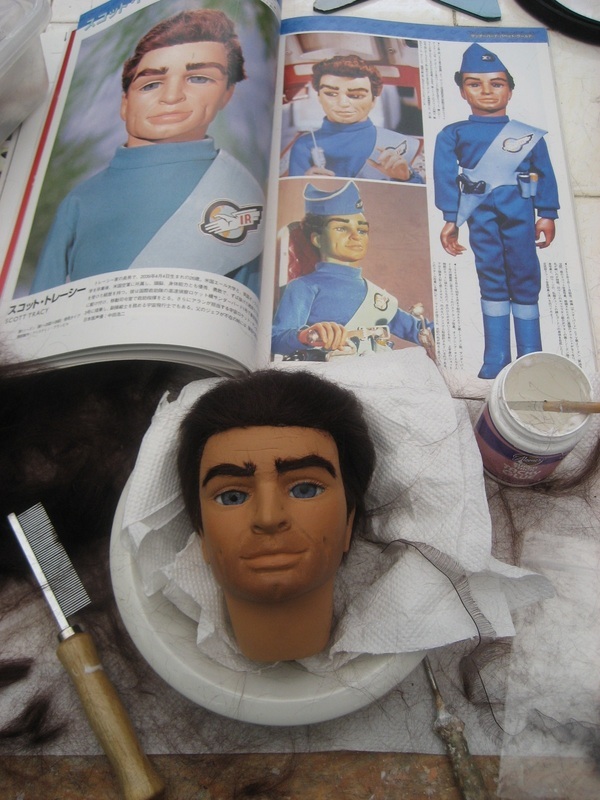 I made Scott using a Thunderbirds Male chest which was signed for me by Shane Rimmer (voice artist for Scott Tracy) at BritSciFi in March 2012. 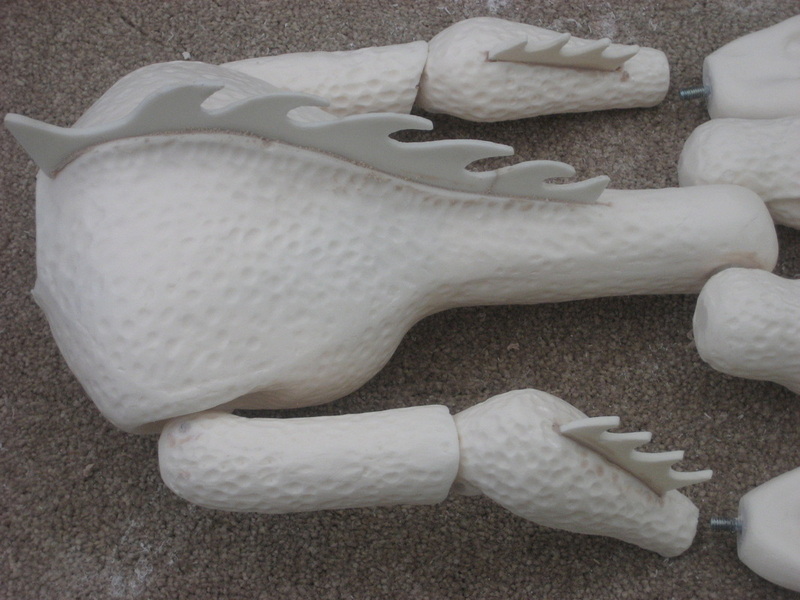 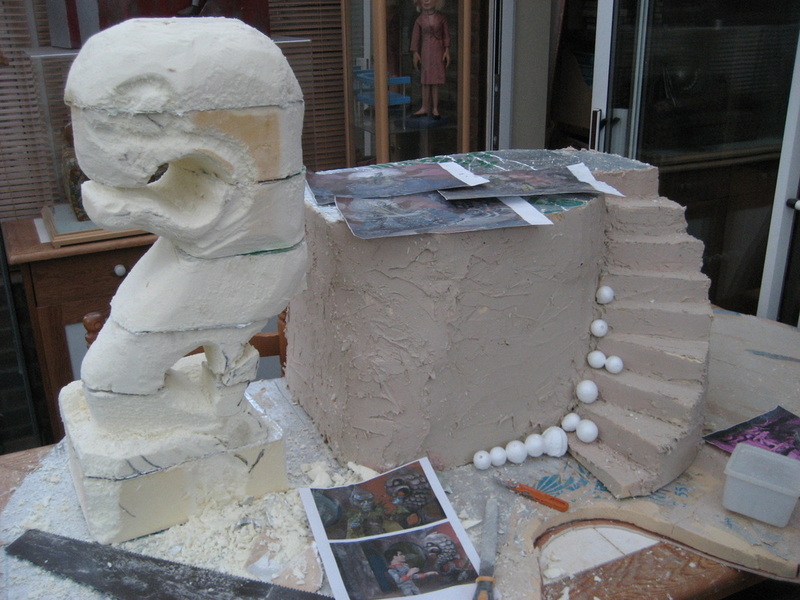 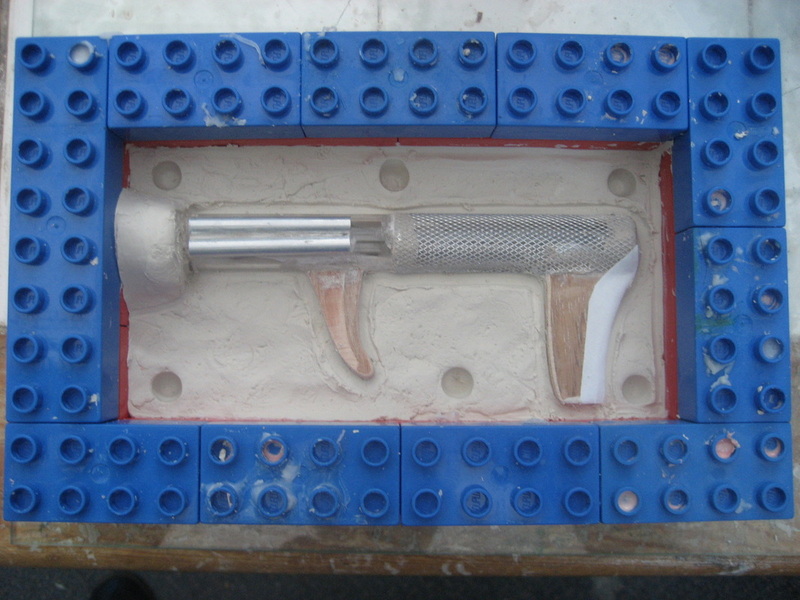 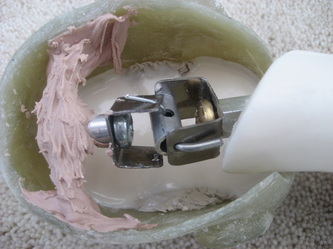 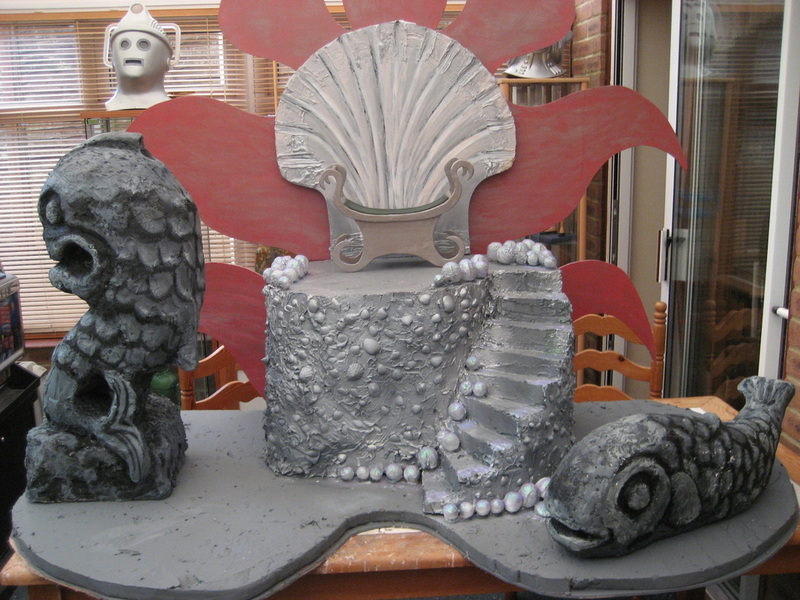 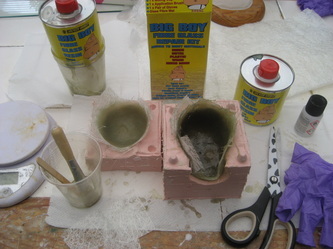 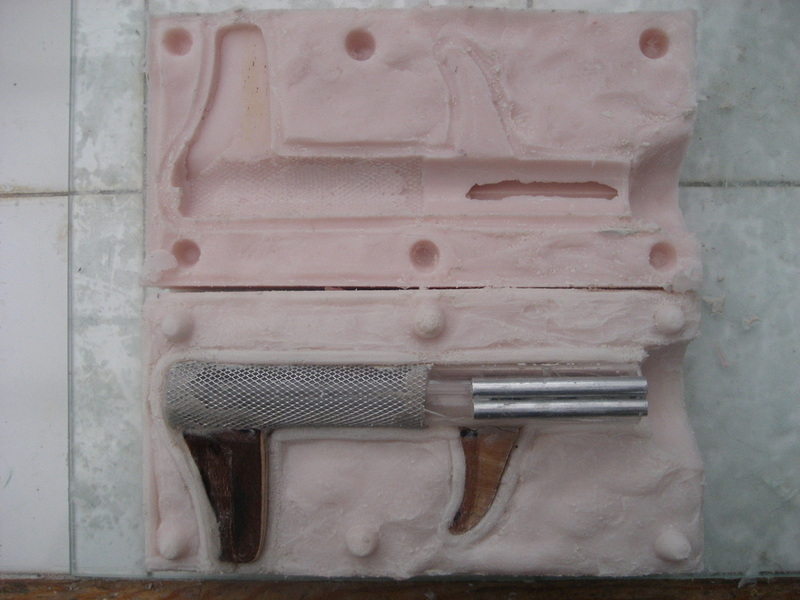 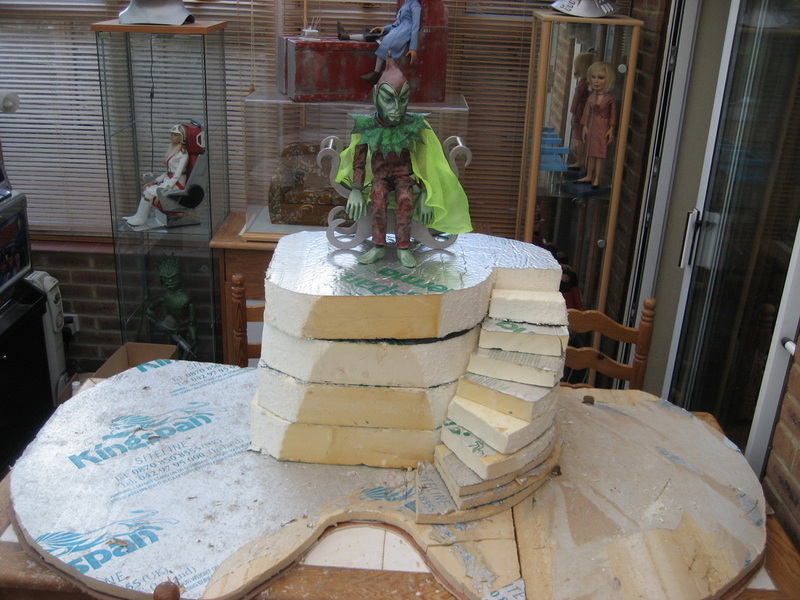 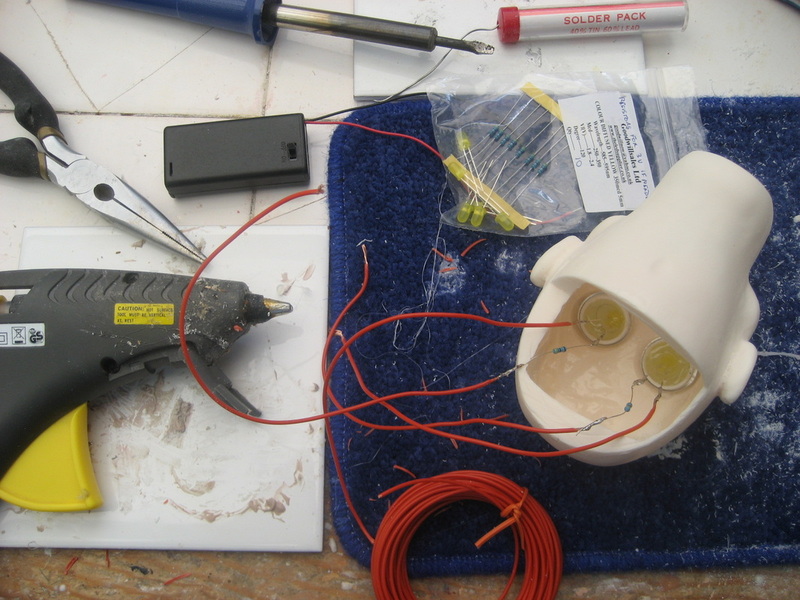 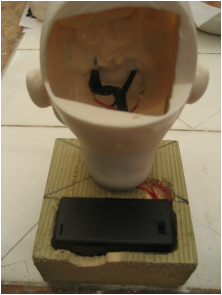 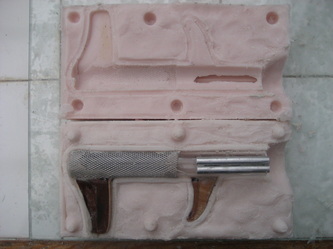 Scott's components consist of a collection of failed casts (now repaired), the signed chest, casts made during other builds from spare mixed resin, and casts which were bought in order that I could take moulds from them. 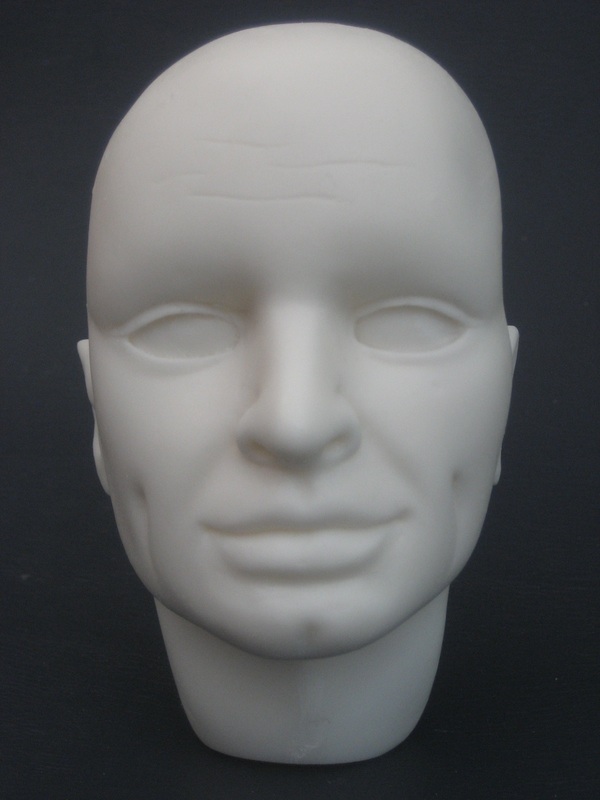 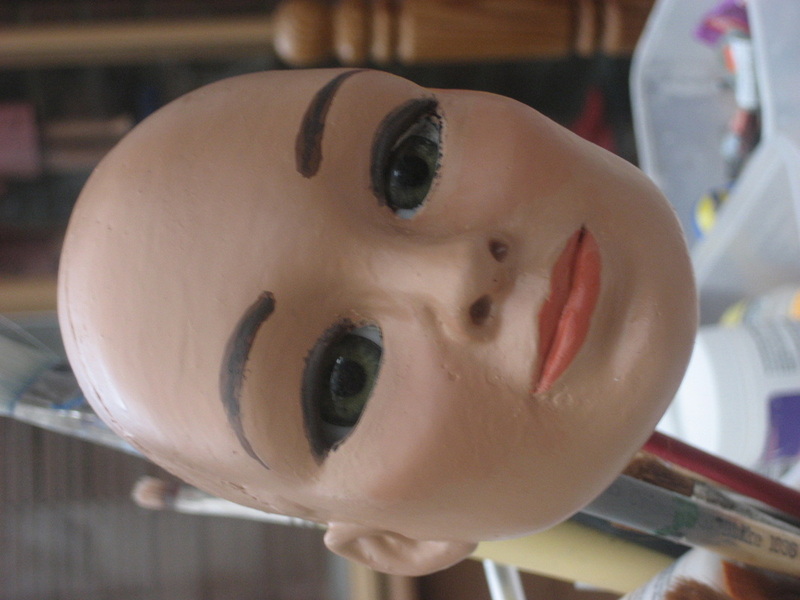 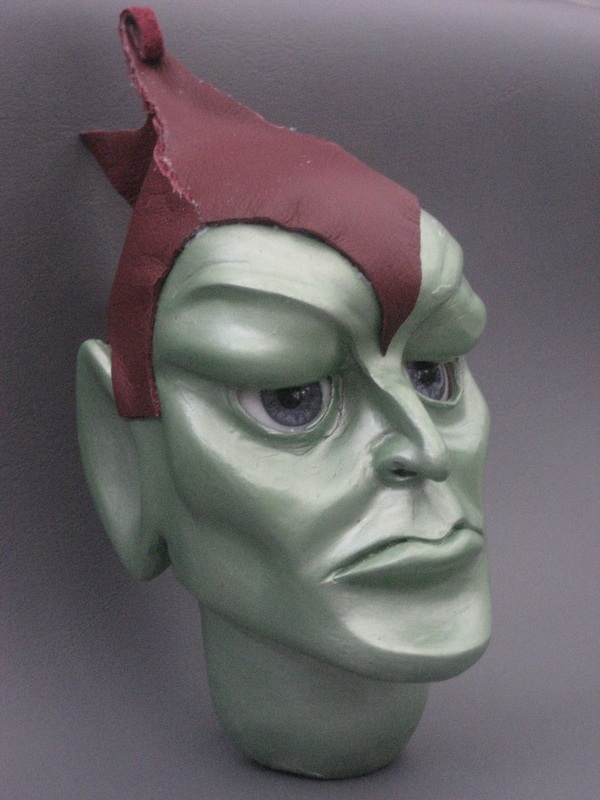 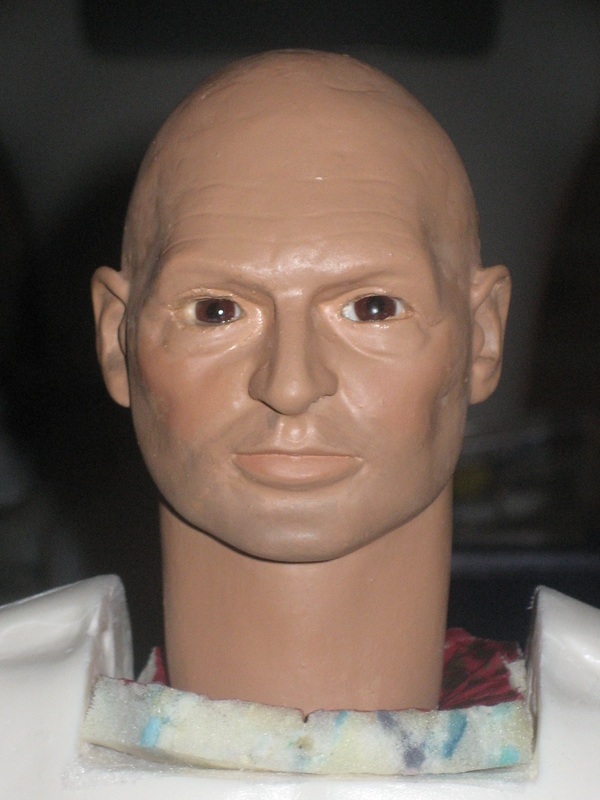 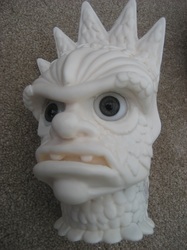 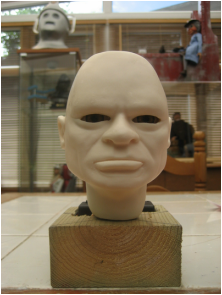 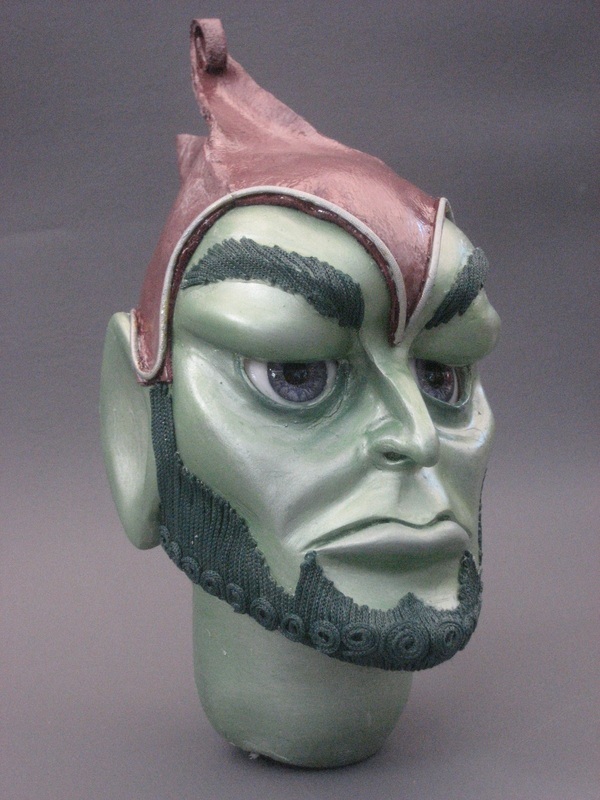 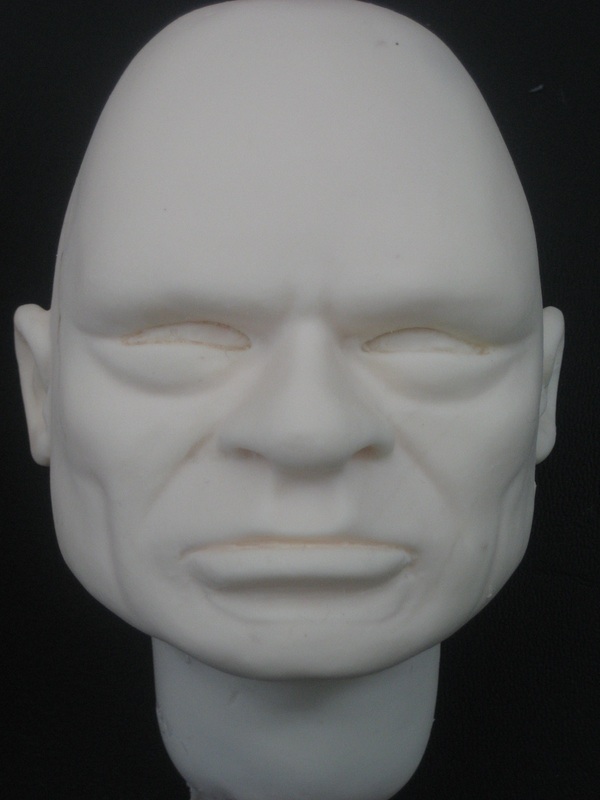 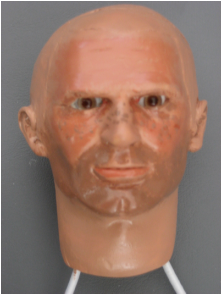 My second attempt at Troy Tempest's head - Completed July 2013. 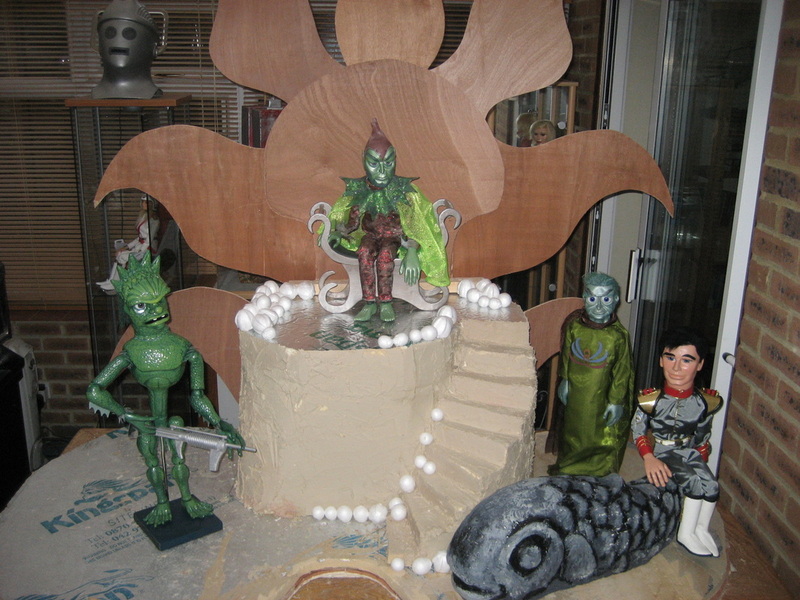 Grandma and the San Miguel Bridge from the Thunderbirds episode 'Move and You're Dead' - Completed June 2013.